Leberecht, my Prussian H0 layout. 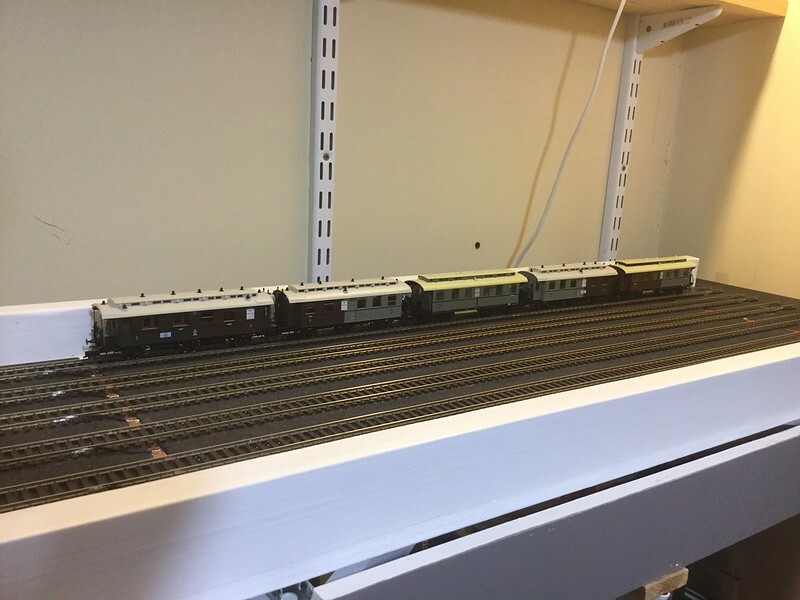 My name is John Edge and I am a H0 scale modeller living in North Western England, halfway between Liverpool & Manchester but I am not really interested in football! I am very passionate about German railways though, I love them all! 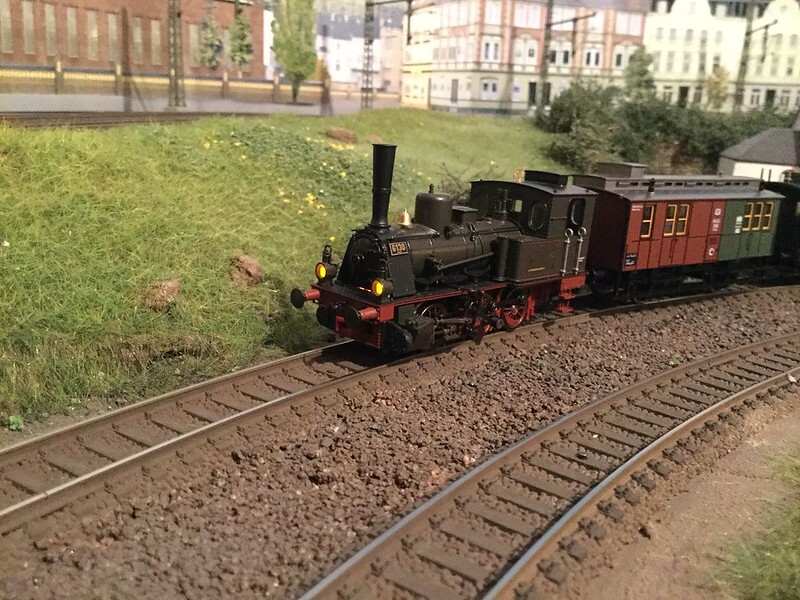 I have a diverse collection of H0 equipment from Era I through to Era VI but lately I have come to love the old Prussian railways most of all. 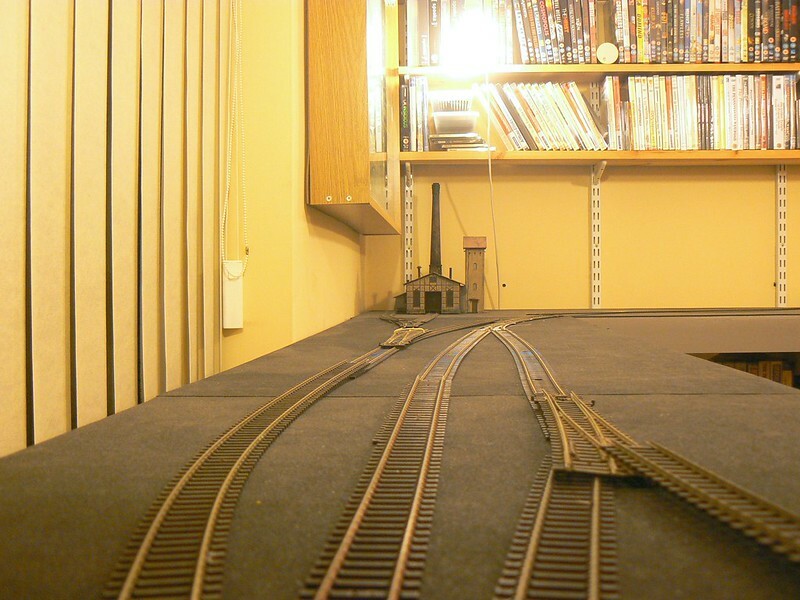 For this reason I have started to construct a suitable Era I layout in my spare box room. 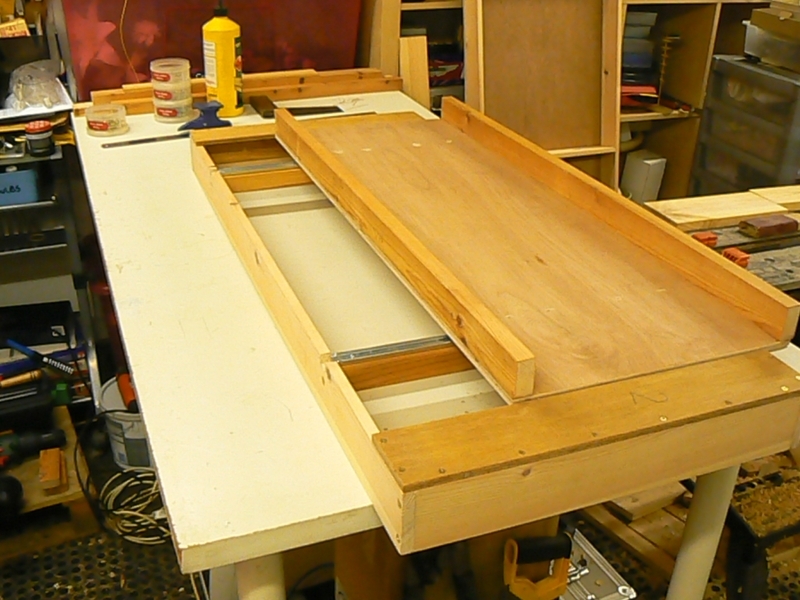 I have built and arranged four boards in an “L” shape of approximately 2.70m x 2.15m, three boards will be scenic, the forth board is a traverser. I hope it at least looks “Germanic” if not exactly “Prussian”. I have had some assistance from a German forum in ensuring that it does follow some aspects of Prussian design.Where in Prussia? I have no idea, hence the name "Irgwendo" which in German means "Somewhere"! Why Prussia? Well, I originally followed the Bavarian railways for a long time but found that in DB days, I liked the look of the former Prussian machines better, they have become some of my favourite steam locomotives. 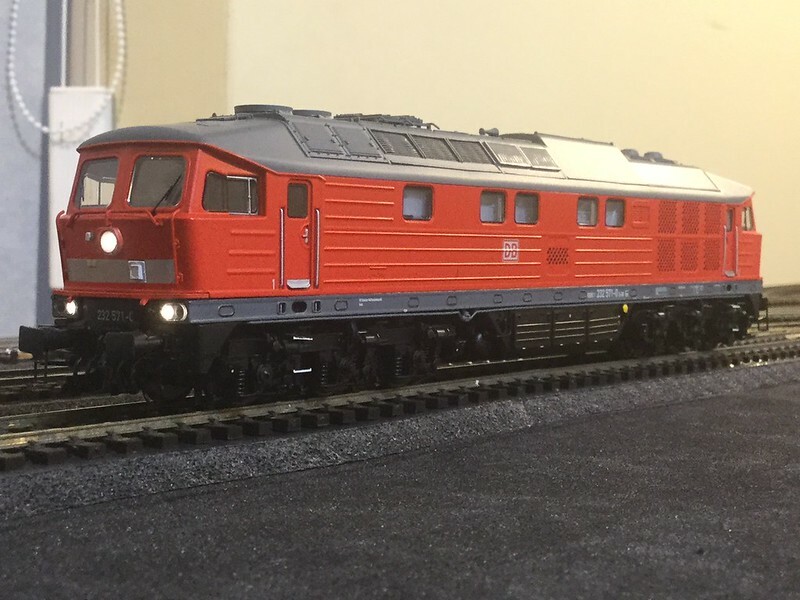 A couple of years ago, a friend sold me a Brawa G 5.4 with DCC sound for only £100 and I loved it so much, I couldn’t stop and now have several locos and have been slowly building up my fleet of Passenger and freight cars. I recently found some pictures I had taken during baseboard construction so I thought I'd post them, hopefully they may be a useful record of how I did it. 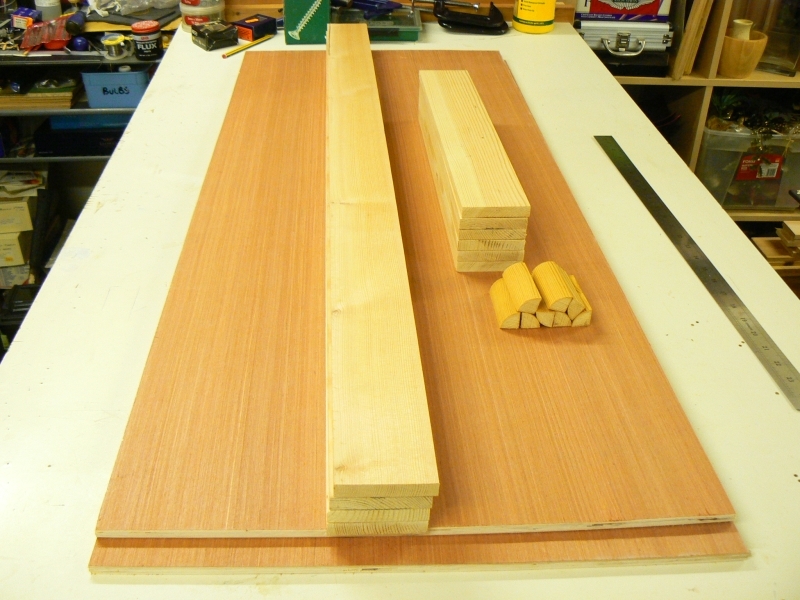 This is the timber for the final two boards, all cut ready for assembly. 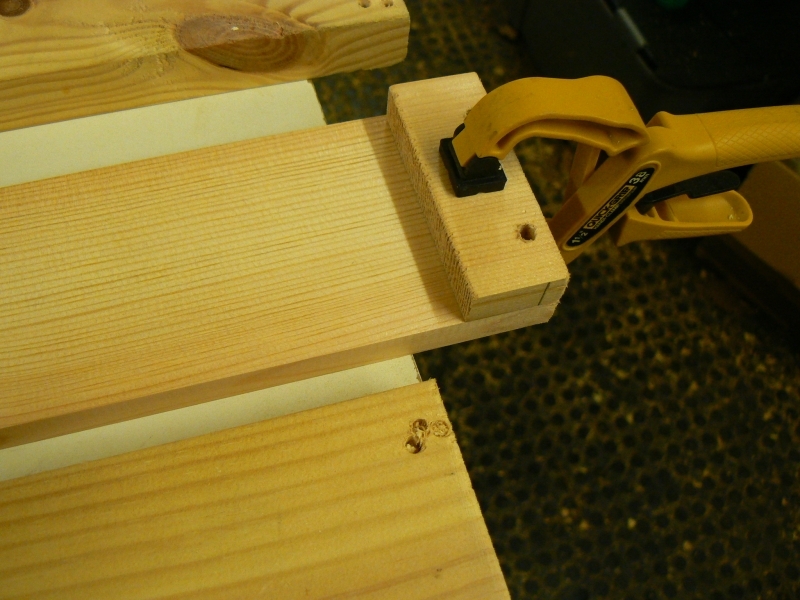 I clamped a pre-drilled 'noggin' of timber to the ends of the main frame as a drilling template. 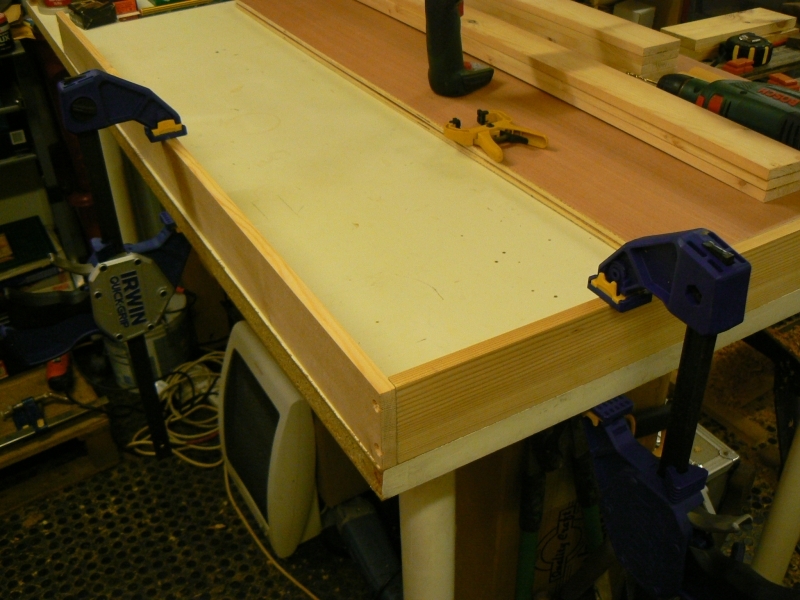 Note the sacrificial piece of timber that I place under the work, this saves the work-piece some 'splitting' and also saves the workbench/table. 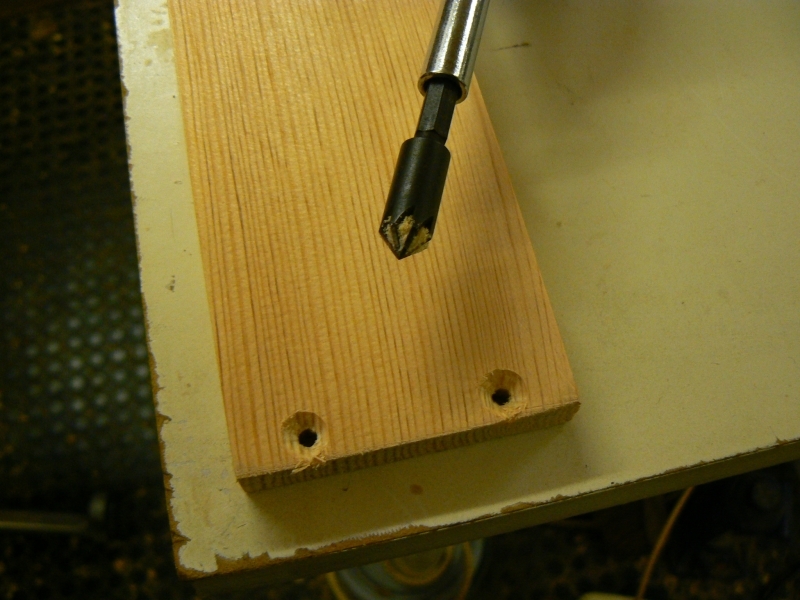 Once 3.5mm clearance holes were drilled, use countersink in electric screwdriver for fast easy countersinking. 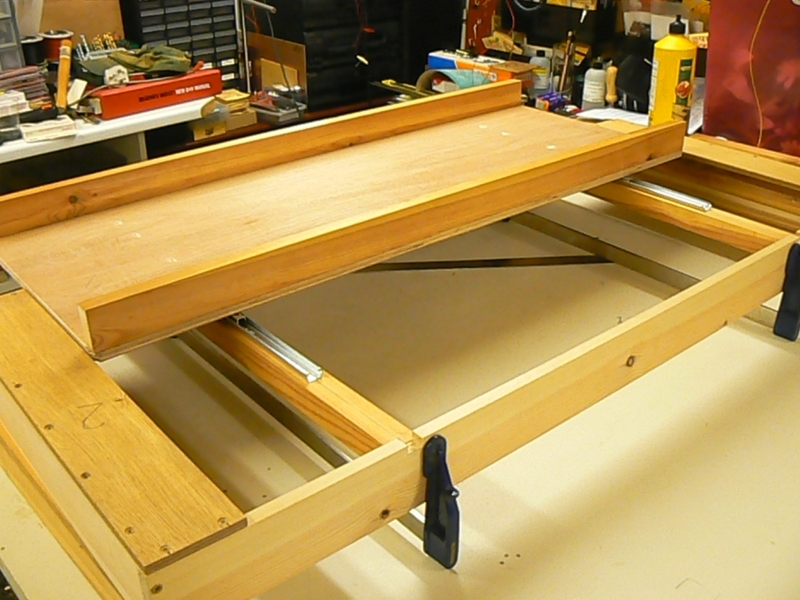 Using the work table to line up side and end frames, then clamping securely into position. 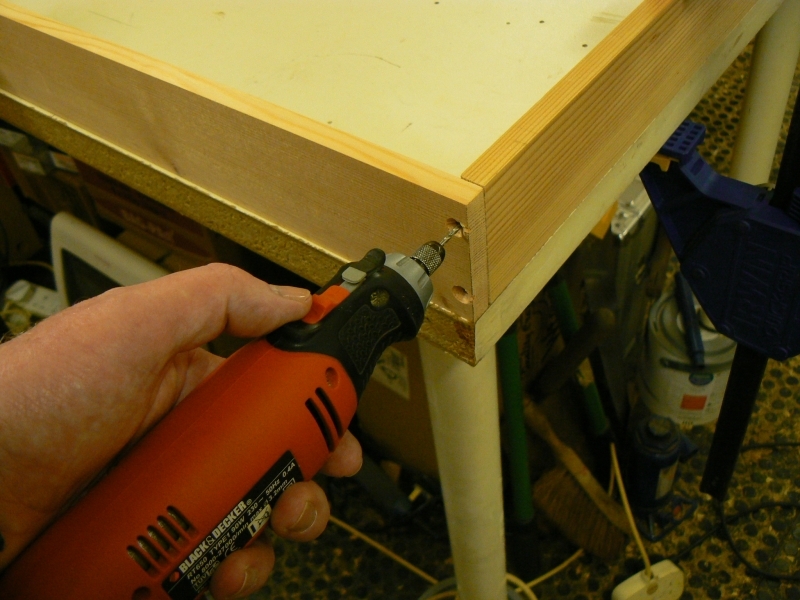 Drilling pilot hole then carefully driving screws home - DO NOT overtighten as the wood will definitely split. This will form an "L", take another side and end & repeat then join both "L"s together now we have a rectangular open box. 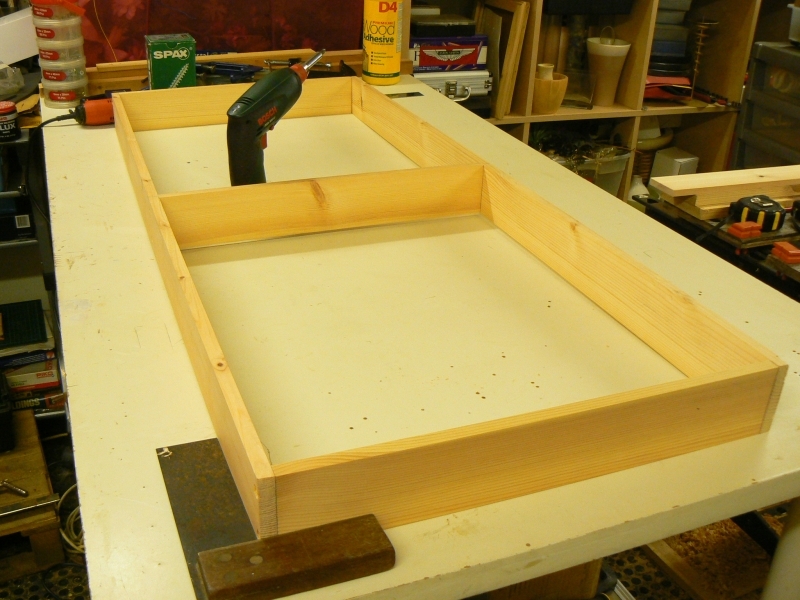 Mounting the central frame piece. Similar procedure to drilling end holes only now I go from pencil lines on my 'noggin! 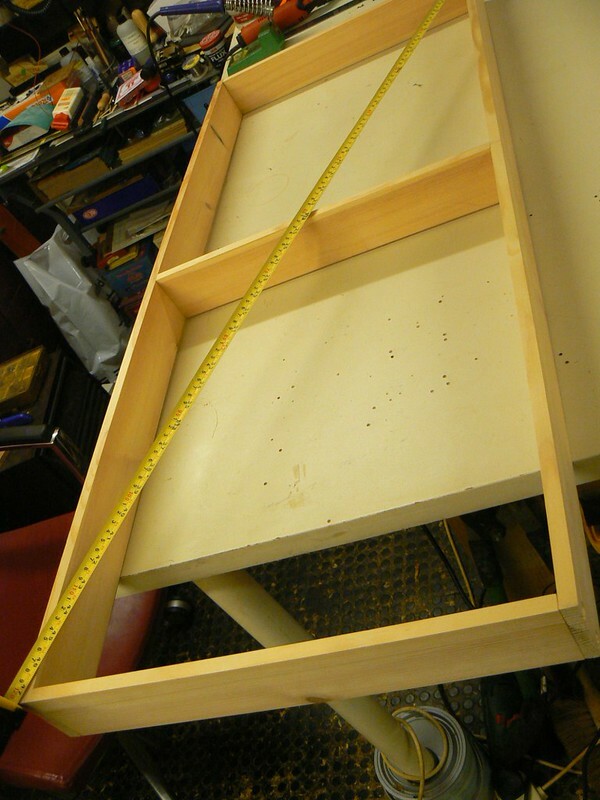 Use tape measure corner to corner as squareness check, I allow up to about 1/8th inch (3mm) here as we're not doing cabinet making and it's soft wood too. 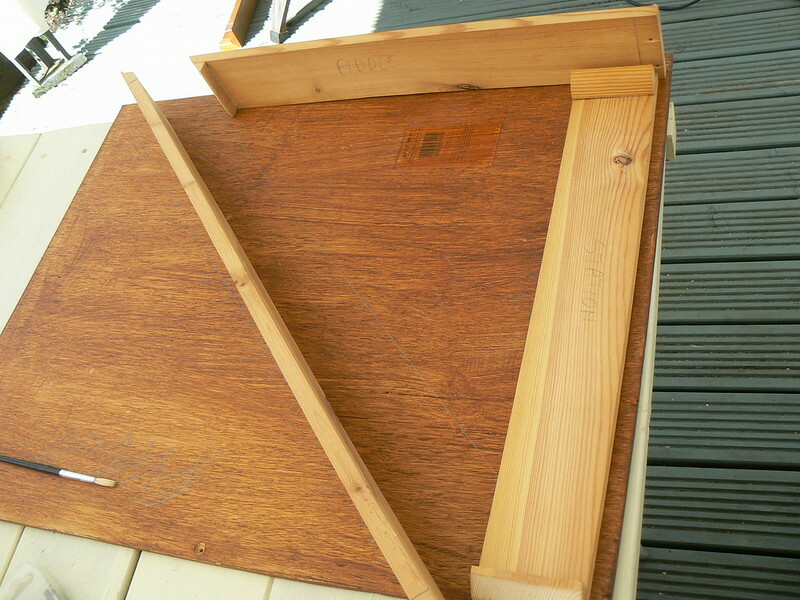 The open box can now be placed on the board top material and the outline of the frame marked out, then you need the centreline for drilling. This is necessary due to the 12mm thickness of the framing, you really need those screws to go in central & square on. Again note the sacrificial ply underneath, my work table still got a few holes in it. 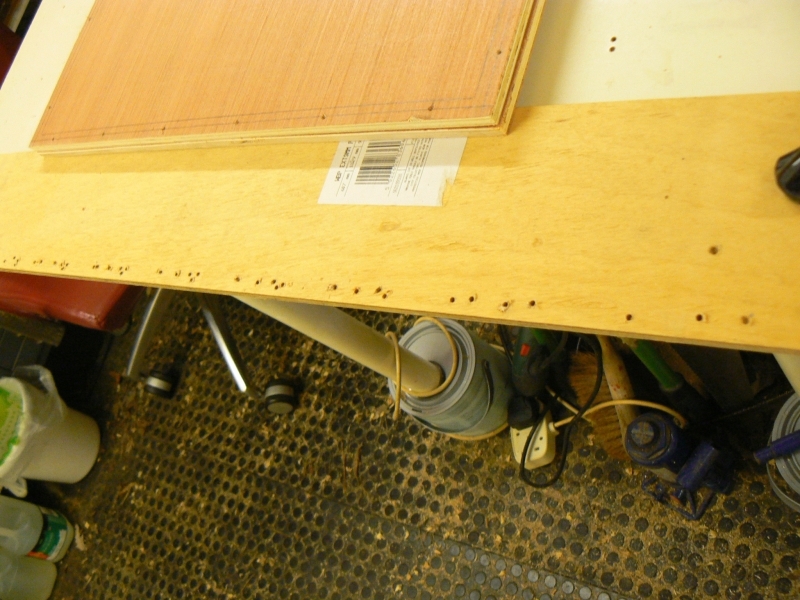 [/url] Now, those EMGS/C&L type board joiners won't work in such thin timber so taking some slim offcuts, screw & glue them into place. What I didn't photograph was, once all the metal furniture was added and the boards tested for fit, I then glued in all those little quarter round pieces seen in the first image of post #13. Not much to see, I use the old carpenters method of smearing glue over the mating faces then 'rubbing' the gluing piece closely into position so the glue gets into the grain, then 'sticks' into position. Needless to say, the glue hasn't set yet but it is enough to hold itself in position until it does set properly. 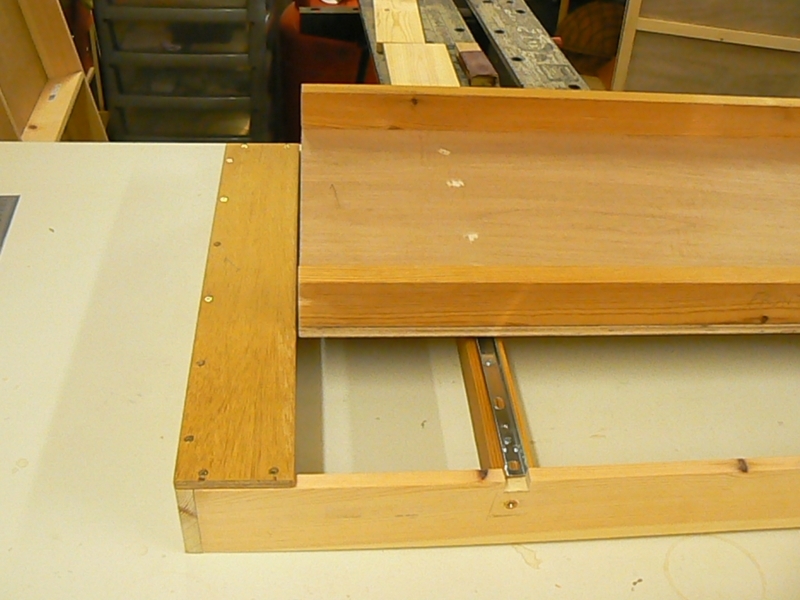 Once all the baseboards had been built and the traverser tested thoroughly (I had never built one beforehand! ), it was time for something I quite dislike doing but is pretty necessary, Painting the boards! 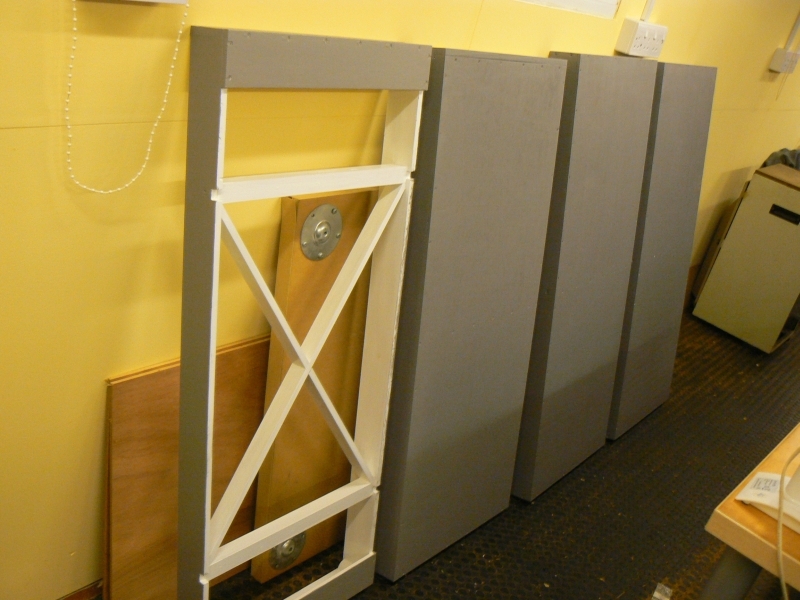 Undercoat and a coat of satin finish white for the underside of the boards, this helps one to see what is going on when one is upside down, underneath the boards - at a show for example! 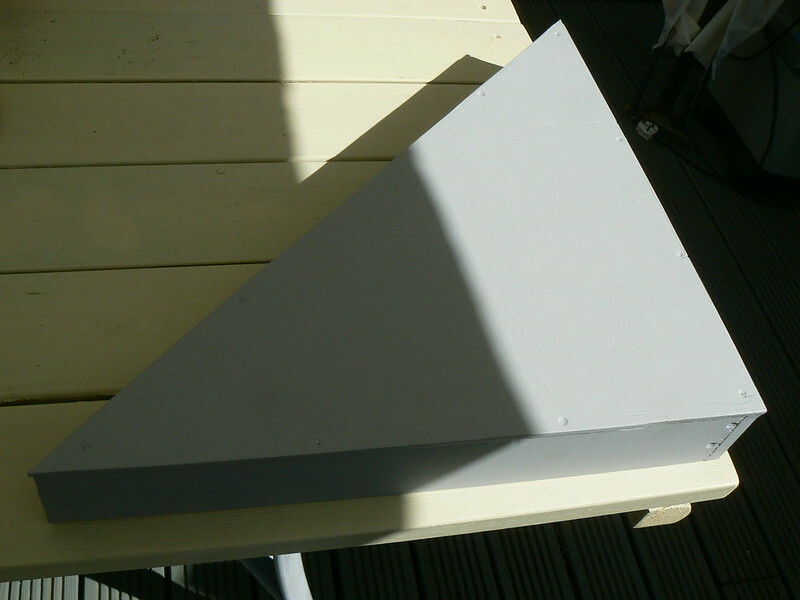 Same again but with a coat of matt grey for the upper side of the boards. Hopefully, all scenic items should bond quite firmly to this surface. 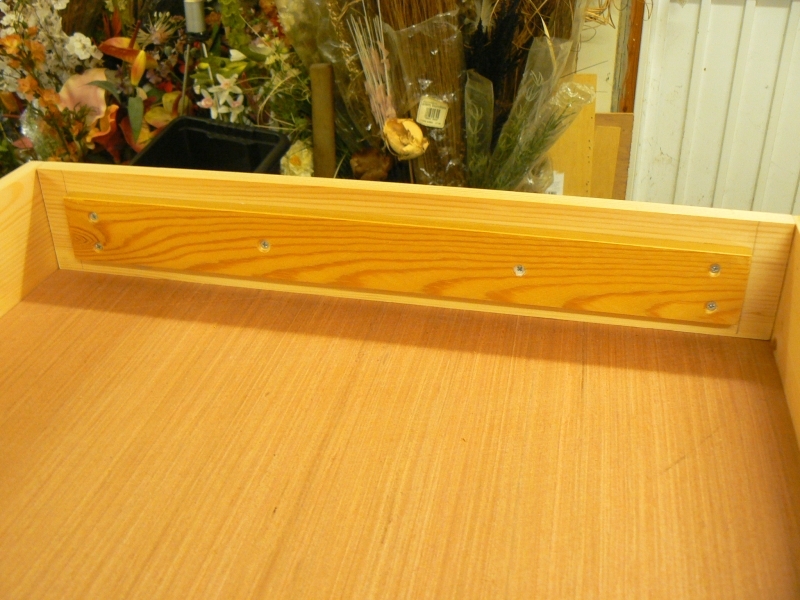 Painting the boards helps with protection for the woodwork and reduces movement in the wood due to moisture. Nice wood work here! 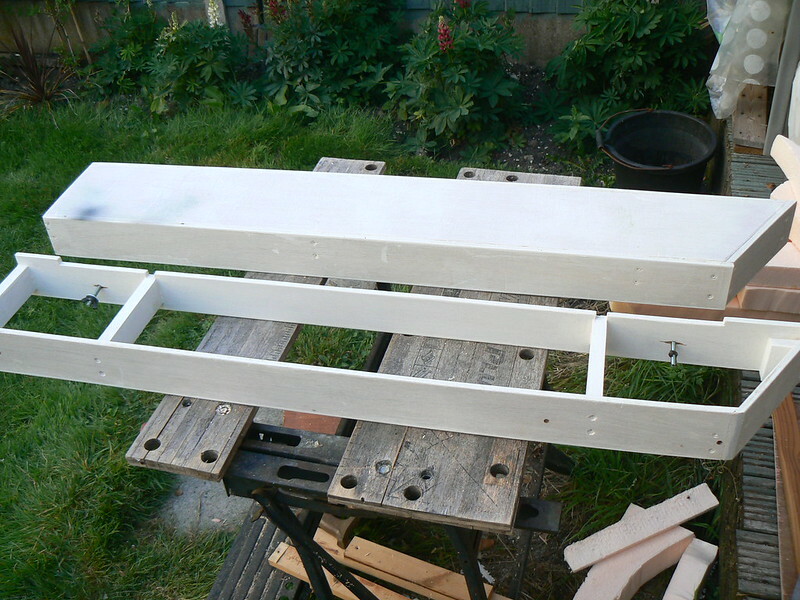 I've never thought to paint the underside of baseboards white, but I may start doing that myself! Any pictures of the traverser? Keep the updates coming! I am fairly certain from playing Napoleonic toy soldiers Berlin was the capital of Prussia how big the state actually was I am uncertain, it might pay to phone a friend on the Historical Geography though . I look forward to seeing progress. A 25mm minifigs mounted General Field Marshal Von Blucher (spelling) he pretty much sealed Napoleon's fate at Waterloo, so as a statue he should not start a diplomatic incident. Painted to look like weathered bronze might look good in a public place and help as a location setter?? Many thanks Matt and John! Yes! I like the idea of having a statue of someone but Blucher sounds very good indeed, I really like the thought of him (as Stephen Fry might put it), giving Frenchie a "damn good thrashing"! Before anyone get upset by that, I have lived in France for some five or more years cumulatively. 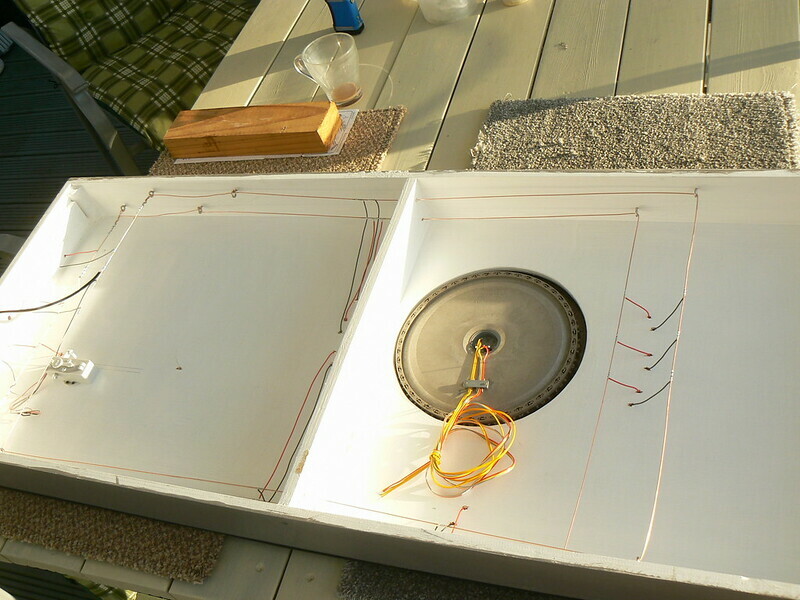 You already saw in the previous photos, the underside of the traverser board has a large "X" to brace everything and hold it square. 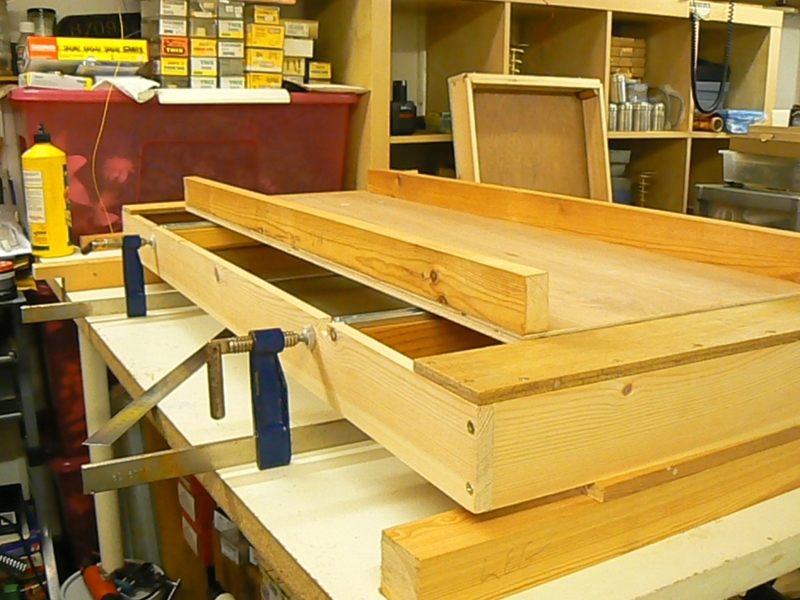 The top surface simply has two inch and a bit square bearers for the drawer runners to screw onto. 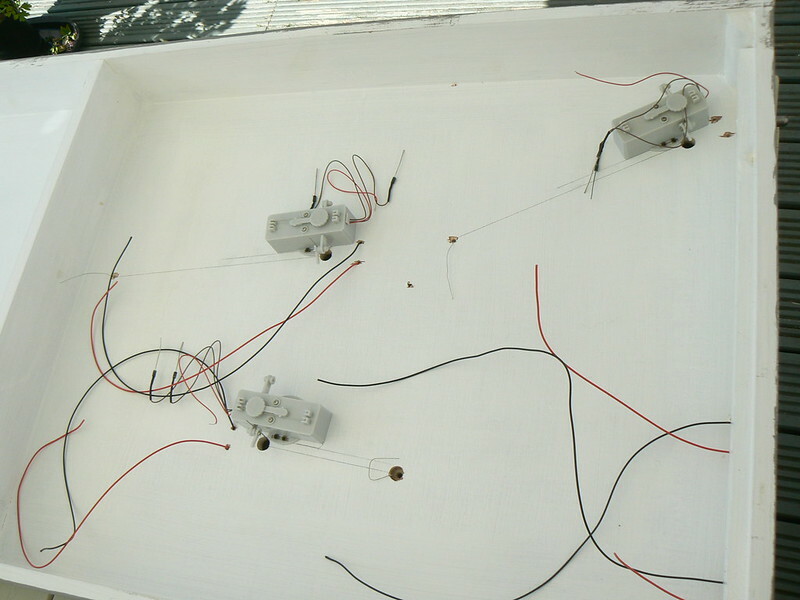 The traverser itself is simply an upside down "box" with open ends, initially I screwed the runners to the traverser, this way I knew I could get them parallel to each other. In the above photo, I am clamping the bearers to the board and checking all alignments. 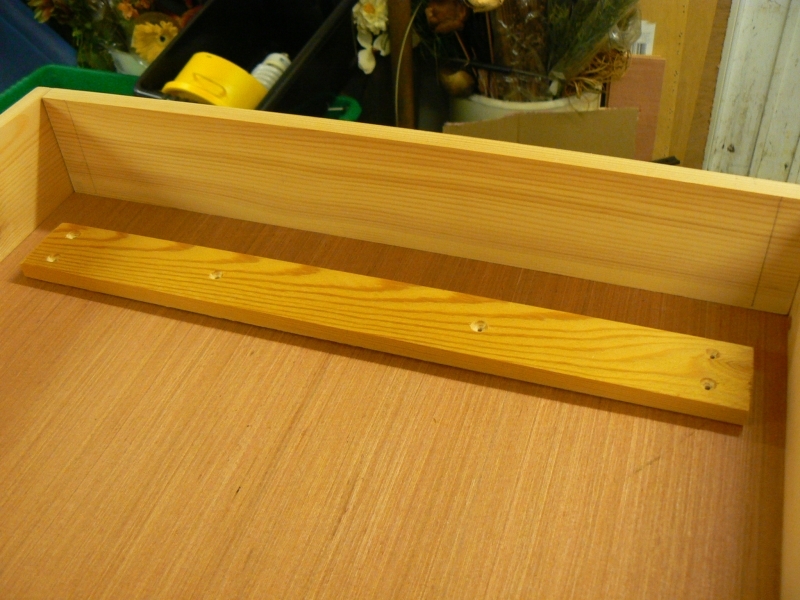 You may see that I had to 'notch' the sides of the baseboard to allow the drawer runners to work! This is the kind of thing that only trial and error (or experience) will show you. Curiously, I can't see the "X" on this photo, maybe I added that later? 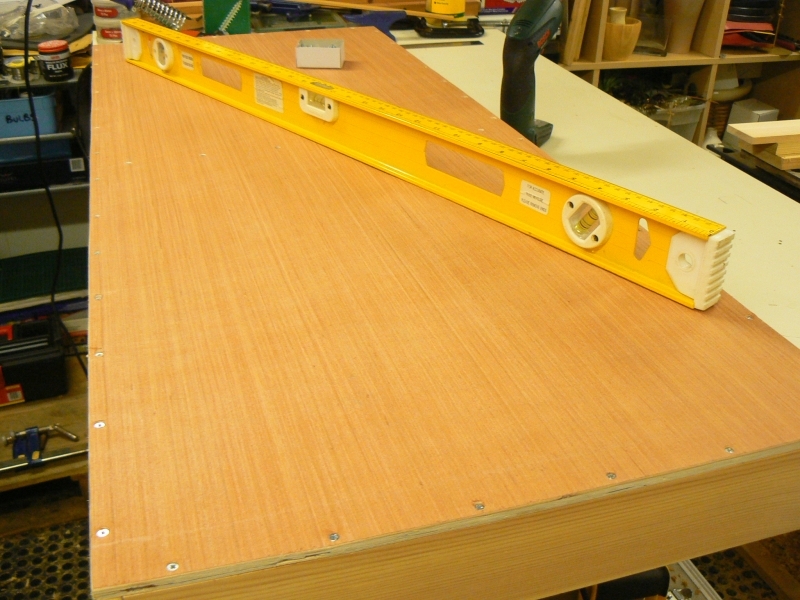 That was naughty of me, I should have made sure the board was very rigid before aligning the traverser. As I say, I had never made one before though! Now all screwed together, looks like everything works. That's basically it. 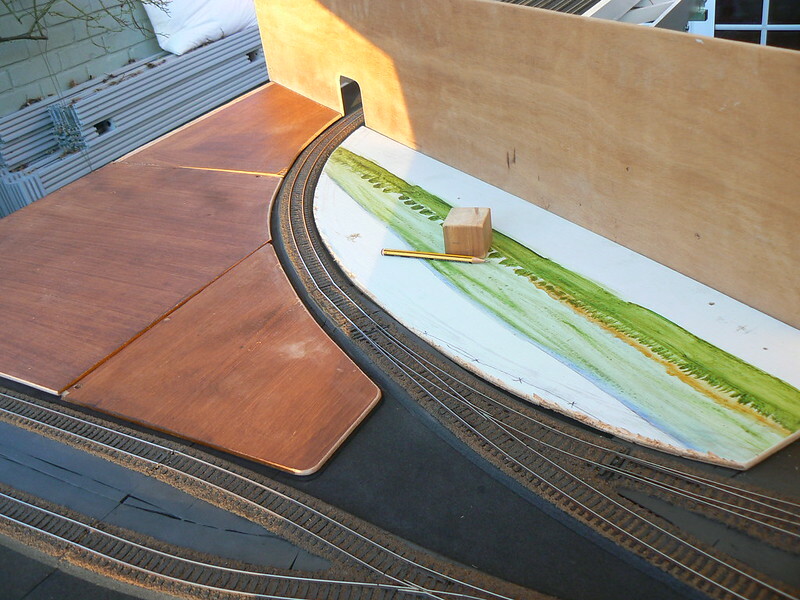 You can clearly see the traverser itself here - the base was made of ½ inch well seasoned plywood with 2" x 1" side frames - it's quite heavy but I wanted to make sure it would last well, especially as it may well serve other layouts in the future. 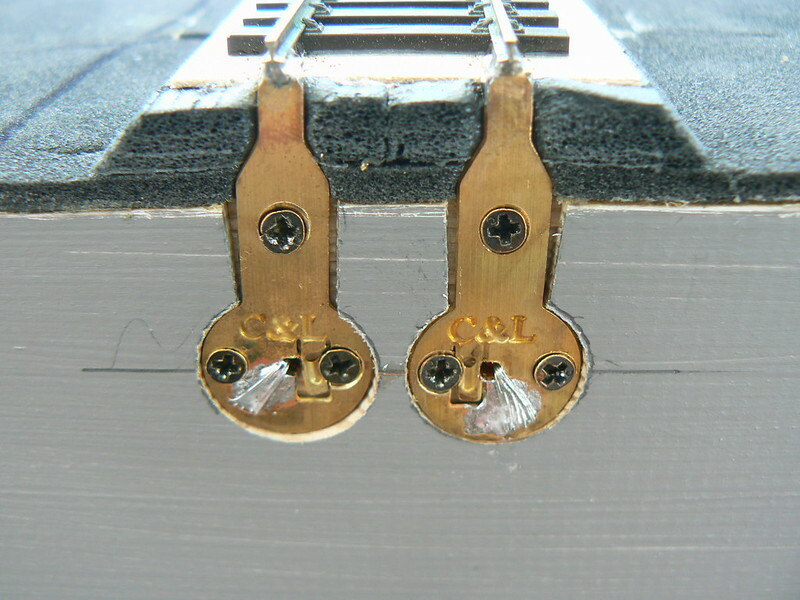 This is the reason for the two inch wide strips of plywood, either end of the traverser - to aid any future alignments. You are correct, Berlin was indeed the capital of Prussia and it was actually a very large state, the largest of all the states that together made up "Germany" in or just after 1870. Yes, folks - "Germany* " was only really created in 1870 and of couse, largely dismantled in 1945. Most people think that it was split into two Germanies, easy & west but also, the state of Prussia was dismantled as it was blamed for the militarisation that led to both world wars. I'm just relating the historical facts here, nothing political (I hope). I'm certainly not denying that Prussia was a militaristic and expansionist nation, I suspect it may not have been a particularly pleasant place to live in and certainly an unpleasant place to live next to(!) but boy, they certainly did exploit their railway system and encourage rapid development - witness the rapid and early development of their electrified railways. I'd like to one day model an early electrified line but for now, it's expensive enough just trying to obtain suitable steam locos. he was some fascinating chap, thanks for the tip! *as we think of it today! Tucked in behind a store cupboard on one side! Spanning quite a chasm in front of the window. You can see the entire thing is supported on metal shelving brackets - as are all the rest of the shelves in this room! I put a LOT of securing bolts into the walls as I don't want this lot falling down. Again it is tucked in behind a store cupboard which unfortunately limits the amount of movement available at home but it should be sufficient. I hope it lives up to expectations myself! Having got the baseboards built, it was time to see how things look with physical track and structures placed in position. 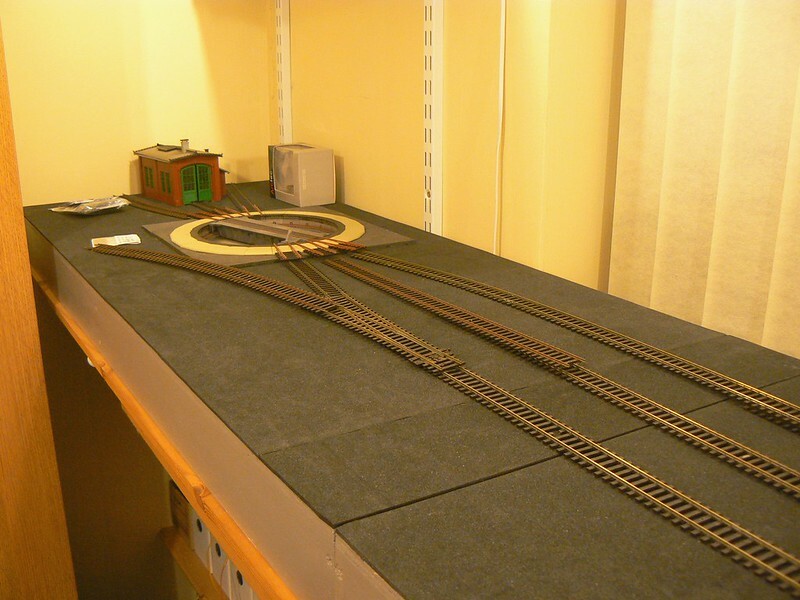 The turntable and shed area, this is quite a focal point of the layout as a lot of the movents will be focussed on the table. Any run round move, loco servicing or turning, all uses this! The trackplan originally called for four tracks through the station area but it would have looked cramped so I settled on three. 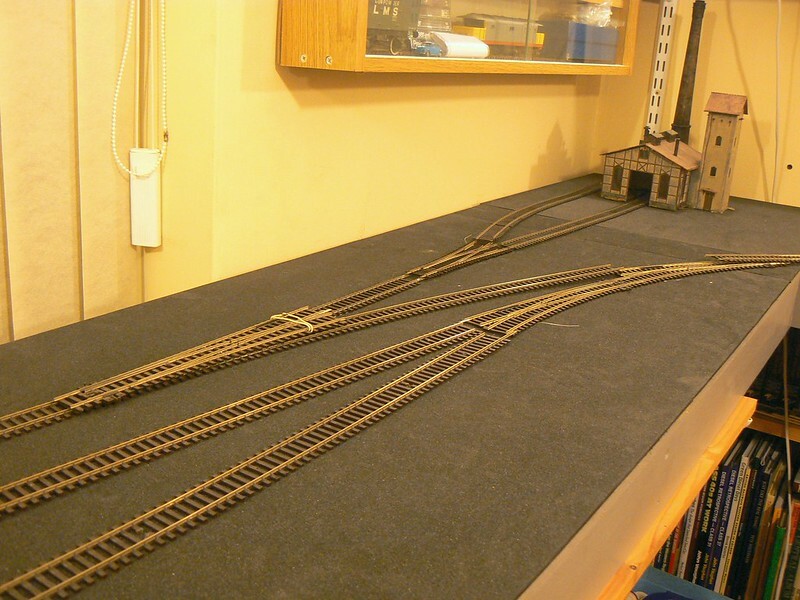 Two sidings for the quarry area looks fine. A chance for a nice wooded hillside I think? 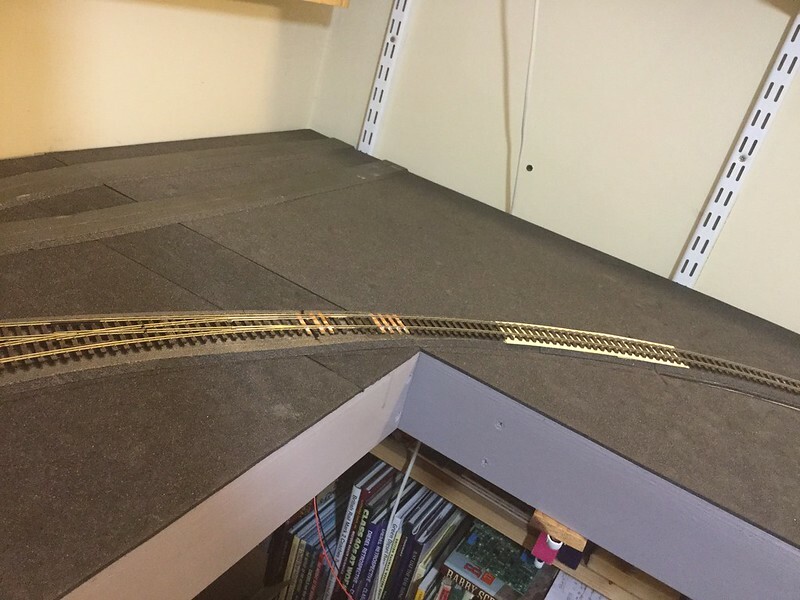 I'm not too keen on how close I have to bring the track leading to the traverser, to the inside corner of the baseboards, I think I should probably build a "filler" board for this point but keep the running line as it appears in these pictures. That way, I'm only dealing with one board crossing rather than three! Progress has been held up because I'm an idiot! 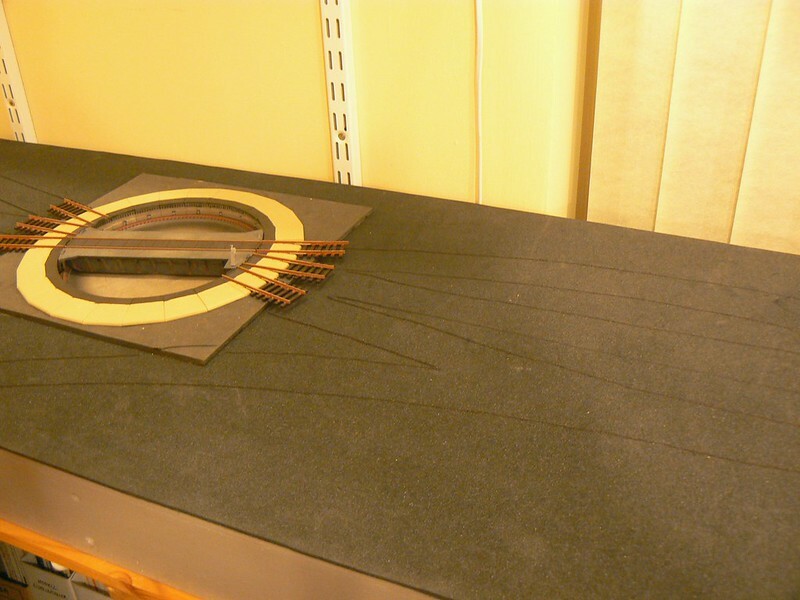 I decided that I didn't want my turntable to have several spurious exit tracks unconnected to anything else so I removed on to see how easy it was to remove the rails and use filler to remove any traces of where the rails where. I then subsequently lost/misplaced this piece of the table, grrr!!! Good news however, I found my missing turntable segment! The bad news was that I only found it AFTER I had ordered and received a set of additional segments from Lippe, they were reasonably priced in themselves but for such a small order, the postage was relatively expensive. Not to worry, at the time, I could not see how else to get around my missing segment! HA! 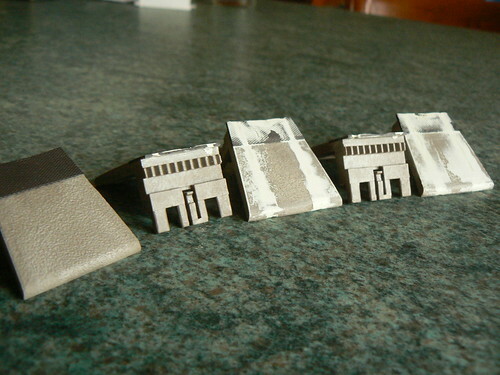 Now to paint, possibly fill & sand again, paint again and see what they look like! I have also found a wonderful picture online showing a similar table in use, in Prussian days. Note that there are only handrails around the winding mechanism, health and safety was much less apparent in those days. A little cheating really, the handrails just unclip from the table, useful! Hopefully, it won't be so long until my next update! Progress on Irgendwo has been glacial I'm afraid! Mum-in-law being terminally ill, dad-in-law not much better, business steady and helping out with my club - all contribute and take their toll. However, I'm finally making progress on rolling stock, may I introduce certain items on here? 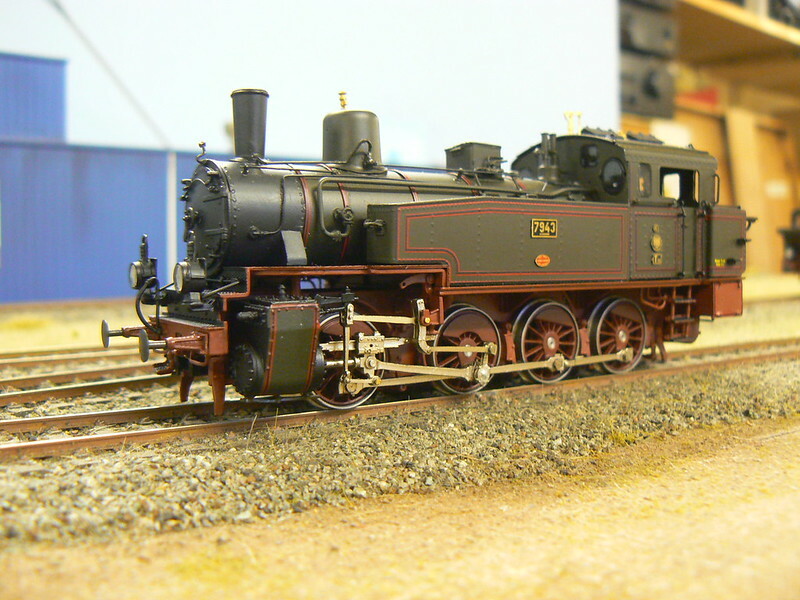 CC my very good friend Doug and seen on his layout, Alte Rinkham. Apparently, the T3 originated between 1881 and 1910 and on the Prussian railways, they numbered some 1345 examples in total. This particular version (431 examples) was built between 1895 and 1905, the Fleischmann version (which I also have!) only numbered 52 copies. There are only some quite minor differences between the two types, mainly around the water tank. 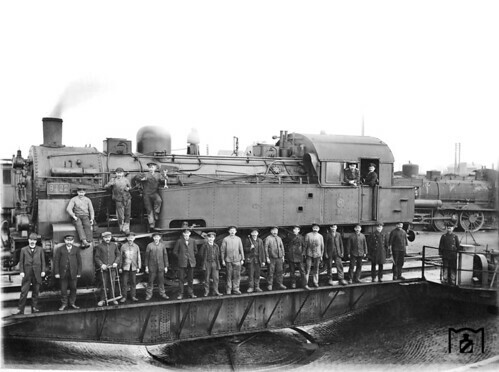 This loco should be capable of hauling a good 36 axles on the flat, this one may need some attention as it seemed distressed at pulling more than 10 axles and very little up DOugies 3% slopes! It squealed at trying such a grade so was hurriedly assigned to a flat route. Despite that, I am very pleased with it although I have read that it's rigid chassis causes hesitation, it ran smoothly enough, only baulking at occasional dirty spots which were soon rectified. Hopefully, I can show more items as time goes on? I'm no great shakes as a cameraman but here is a little video I made recently. I must add, this is on my good friends layout, Alte Rincham now sadly demolished due to moving house. Now that summer is finally over, I hope to start making some progress with this, along with other projects to come. I have done very little with this layout since my last post but a couple of important things have happened. 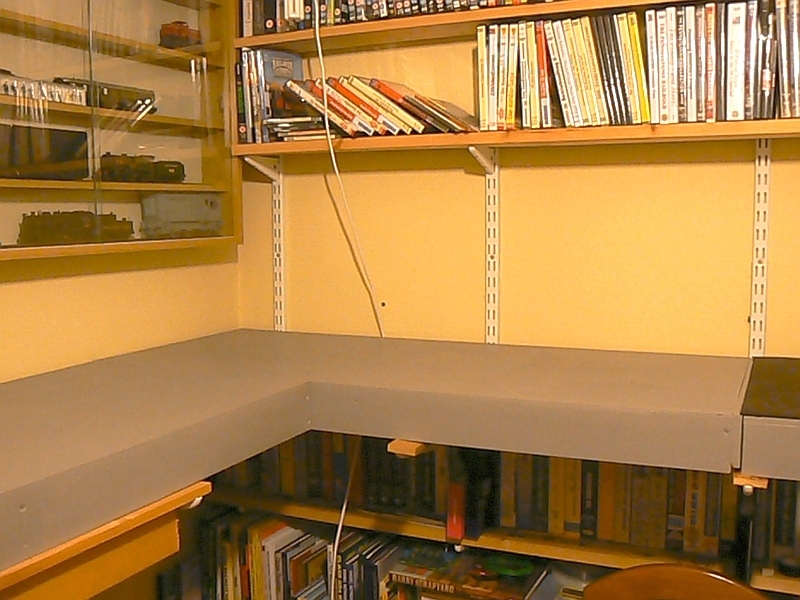 I have managed to clear all the junk from on top of the layout that had imperceptibly built up over time. It is amazing how one just places something with the intention of sorting it later, then something else and before you know it, the layout is invisible and it has become merely a storage shelf, well no more! 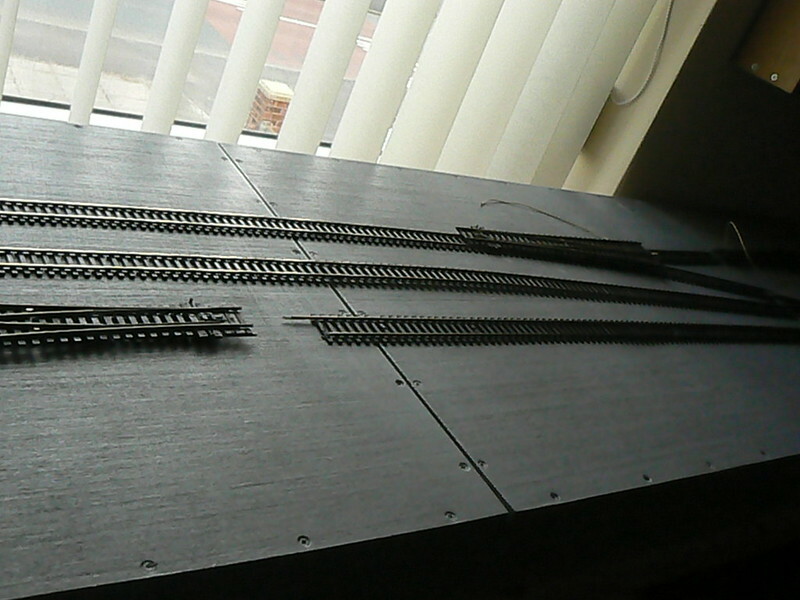 A bit more messing with the track layout and I shall start glueing. Also, I realised that "Irgendwo" (somewhere) is rather too common a name for me, I wanted something different. This fact was hammered home at the recent(ish) ERA show at Edgbaston where there were at least two other 'Irgendwo's. So! What to call this layout? Trawls of the internet proved inconclusive and studies of online maps became brain numbing, then it dawned on me. A colleague had suggested that I place a statue outside my station of Fieldmarshall Blucher as he was instrumental in helping to defeat the French at Waterloo. Reading up on him, what a fascinating character he was. I've still not located a suitable figure of him to be my statue but I could pay tribute in another way. 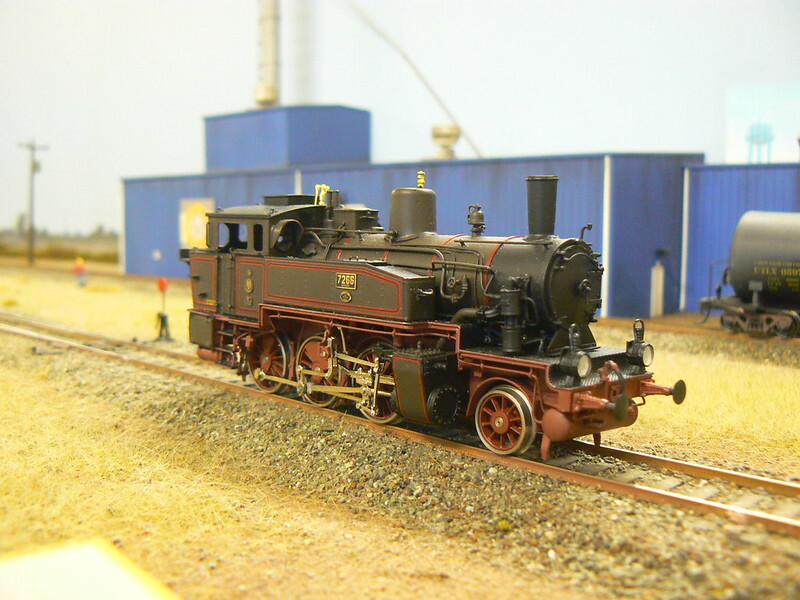 Therefore, my new name for the layout is Leberecht! As in Gebhard Leberecht von Blücher. I think it sounds promising, how about you guys? Both pictured rather incongruously on my American layout, in lieu of Leberecht being very unphotogenic. I must admit - these are both ready to run items, not built by me but by the factory! I dearly wish I could claim that I have built them but no, I am not that good a modeller! 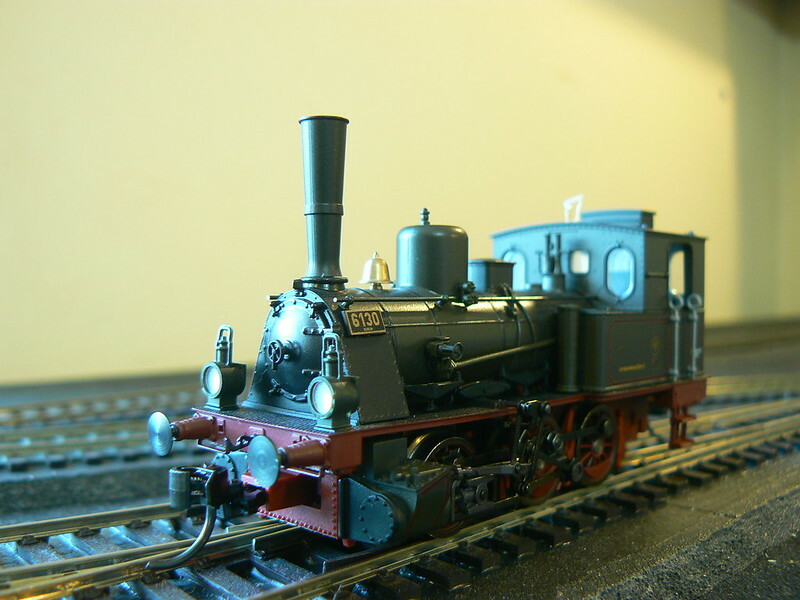 The T13 I won on German ebay after I had been selling off my American 0 scale brass(! ), which was how I could afford it. 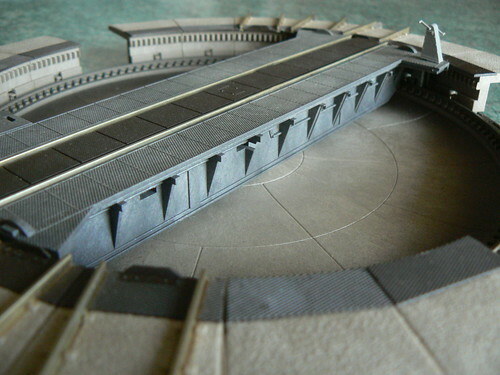 Now, I did do some modelling with this one as when I got hold of it, it was seized up having been presumably sat in a display case for several years. I stripped it down, cleaned and degreased it and re-lubricated it and when it was working well, I digitized it - it is still a little noisy but runs very well. The T9.3 I won at an actual auction for a fair price, it also came with a 'free' Weinert V65! This runs well enough but still needs digitising and as a mate said, could do with its lights making working. Funnily enough, I also have two Fleischmann T9.3's and one Trix T13 - these will be for exhibition use as no way would I take the Weinerts to a show. So, I am a bit of a chequebook modeller but only when it suits me - the Trix T13, in particular, is a far cry from the Weinert one. 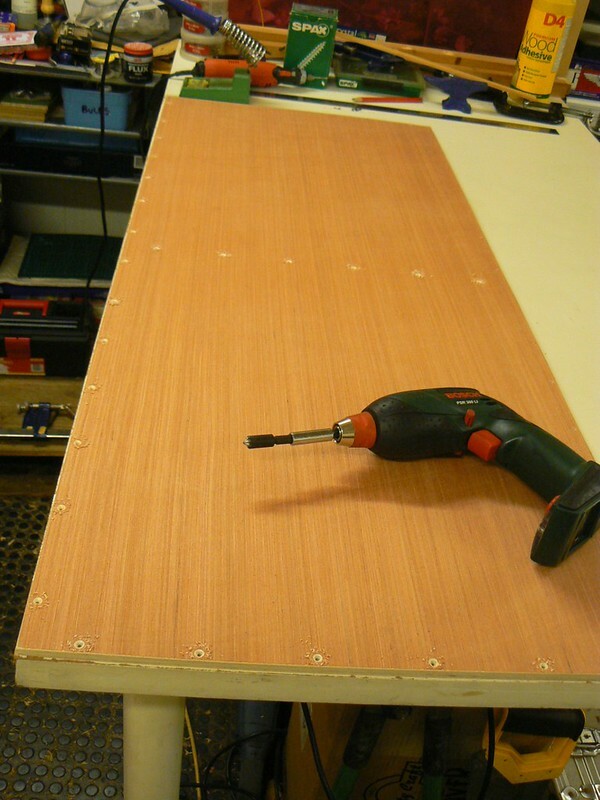 After building my baseboards, painting them and glueing on the initial underlay, modifying and fitting the turntable, I had come to a grinding halt. Family crises aside, such a delay can only be described as running out of steam! Suddenly, my motivation and enthusiasm came back and I was able to contemplate the next job which is track laying. 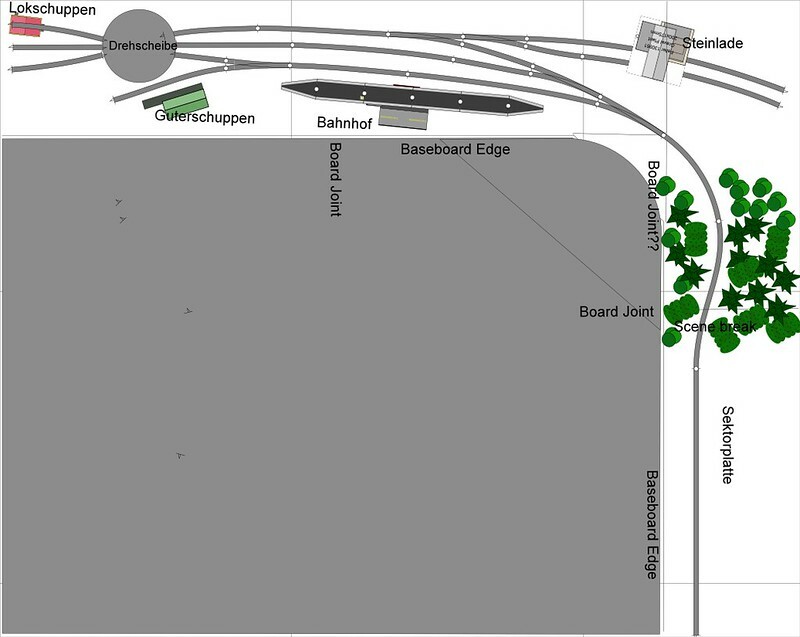 I laid out some track, very loosely and pretty much according to my plans and I liked how it looked. 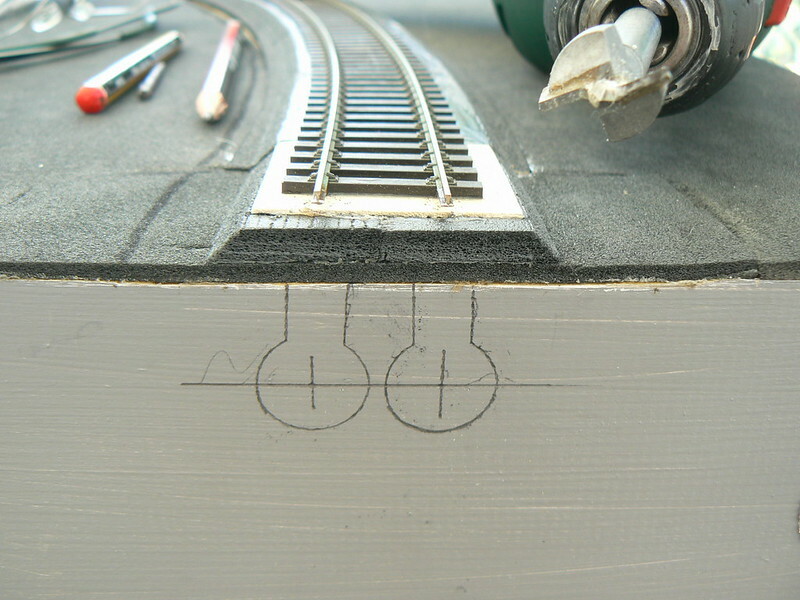 Next, I marked alongside the track for where the roadbed needs to go. Then, wouldn’t you know it? Late in the day, I discovered that my last bottle of ‘Copydex’ had dried up! So next day, off to the shops and resupplies purchased, in smaller bottles this time. 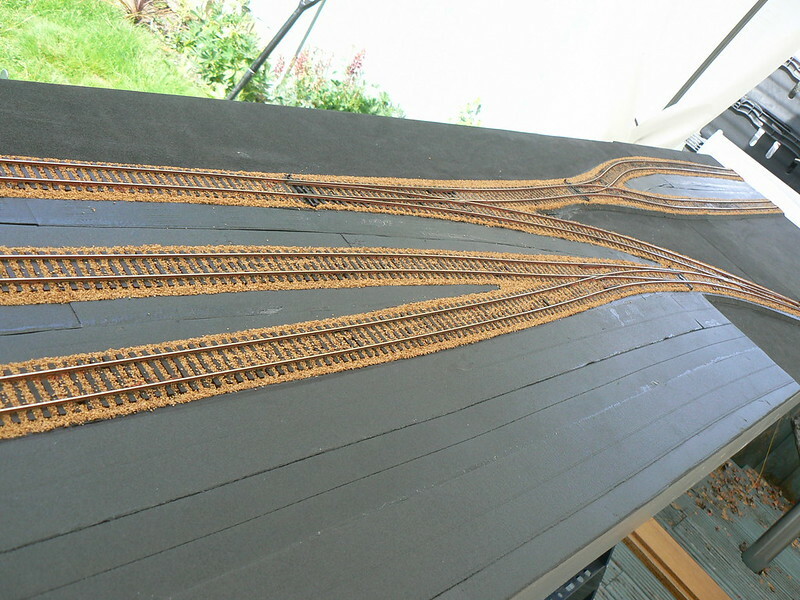 A couple of days work and the roadbed was more or less finished and I can start laying actual track. 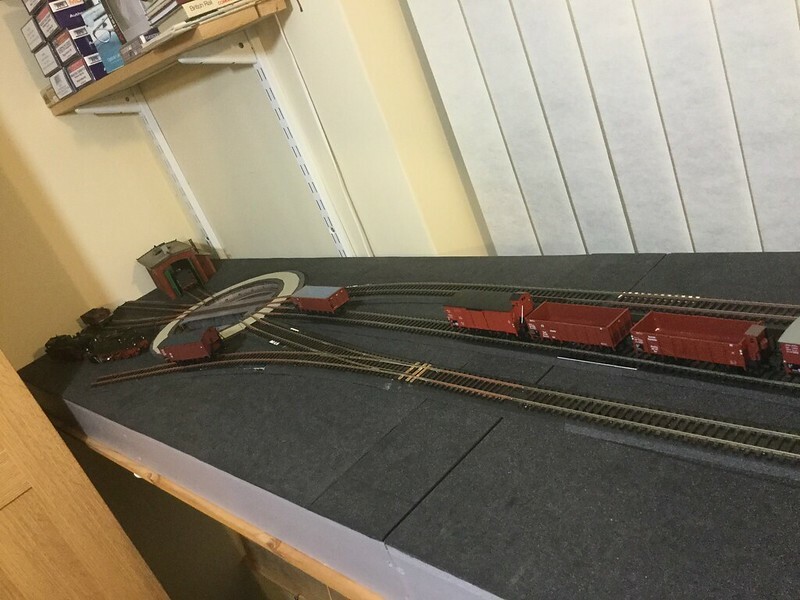 I realised that it was pretty important to work out how to get power to traverser before laying any track so I set to and gave it some thought. 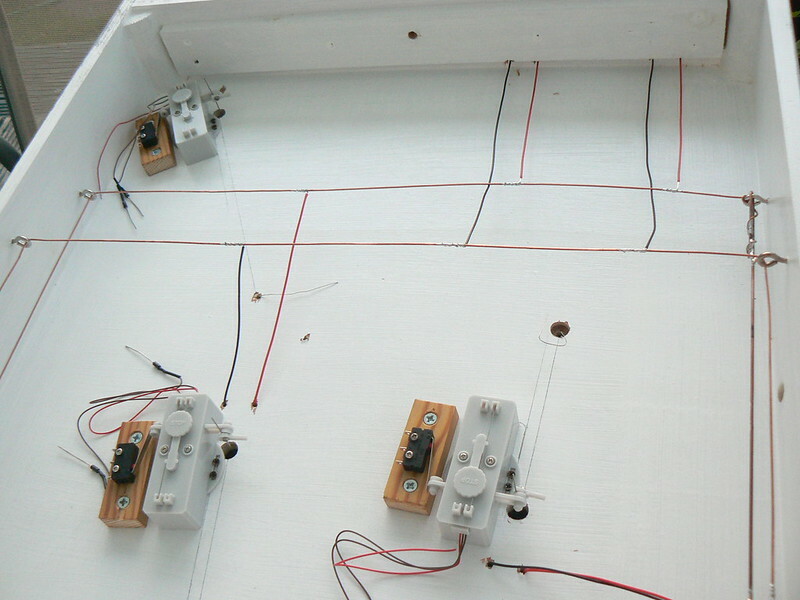 The answer came to me in a flash of inspiration when I realised that I need two wires and I had two metal runners. So, I soon made up some wires and connected it all together, a test run proved the concept worked although I don’t know if it will last well but I made a lot of connections to be as sure as possible. The traverser fully prepared for track. 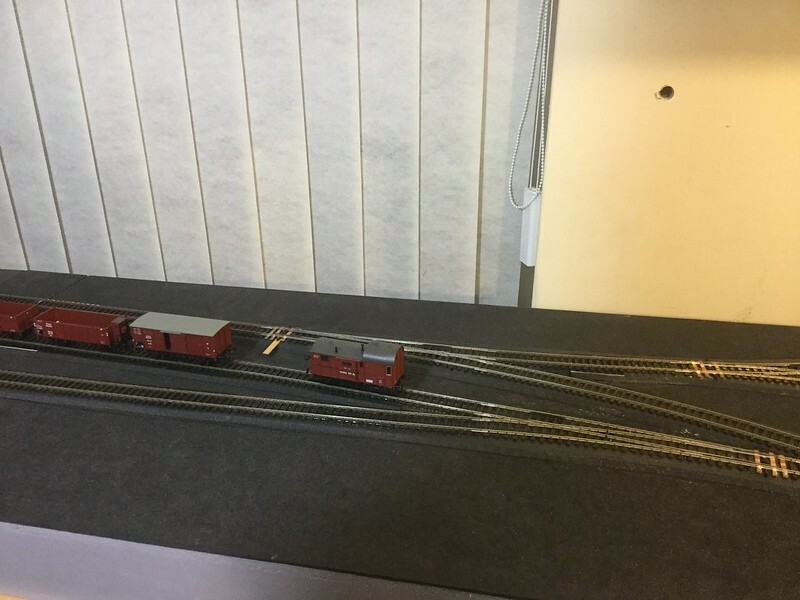 I had to reduce the track height at the entrance to the traverser very slightly so used some thin copper-clad sleepers and while I was at it, I added a re-railer section, I have tested it and it does work. This is only needed while I have not yet built a locking mechanism to keep each traverser track in perfect alignment with the exit track. I don’t know if you can really see from this picture but the baseboard adjacent to the traverser, had suffered a slight distortion. 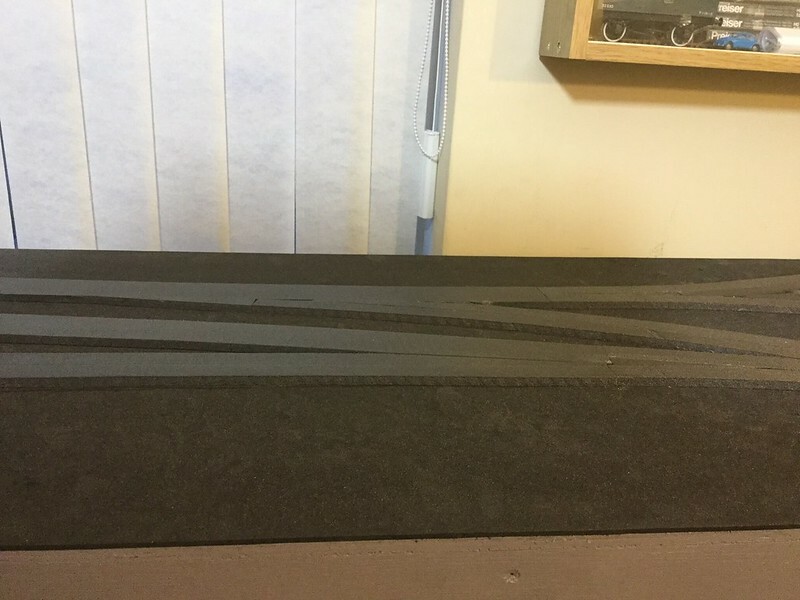 It was simply too much up and down movement for my little trains to cope with so I cut out the entire foam roadbed out and inserted a finely sanded down piece of curved plywood in place, then re-laid the roadbed, it’s not absolutely level but much better now. Serves me right for not using the very best plywood available. 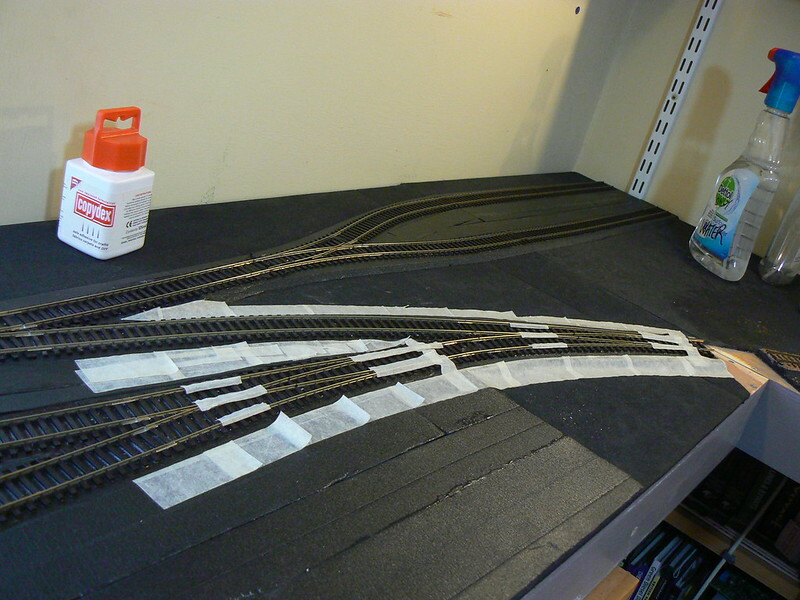 As you can see from here, I still had to glue some thin strips of card under the track. I believe that it is bad practice to cross baseboard joins on a curve? 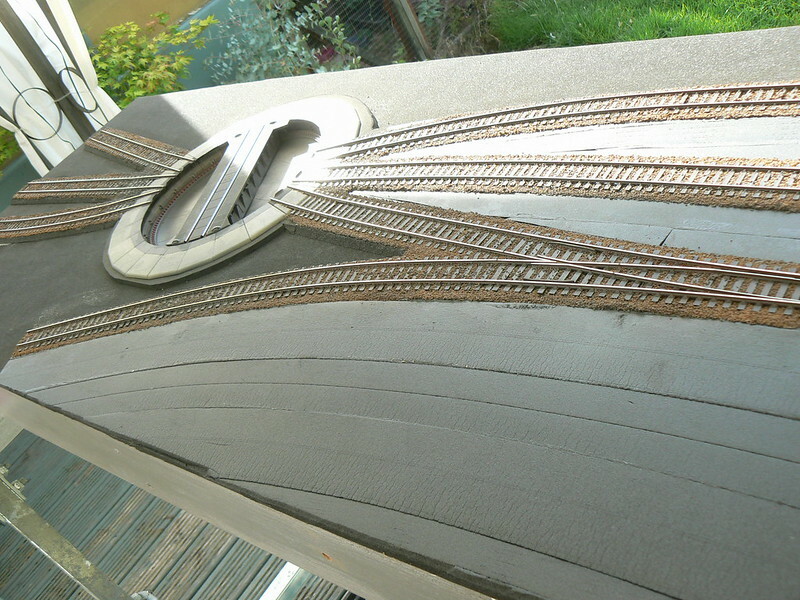 Sadly, it was unavoidable here, I have used soldered copper-clad sleepers again to reinforce the crossing, I really hope that will be sufficient. At the moment, these are not cut through but they will have to be when time comes to split the boards. 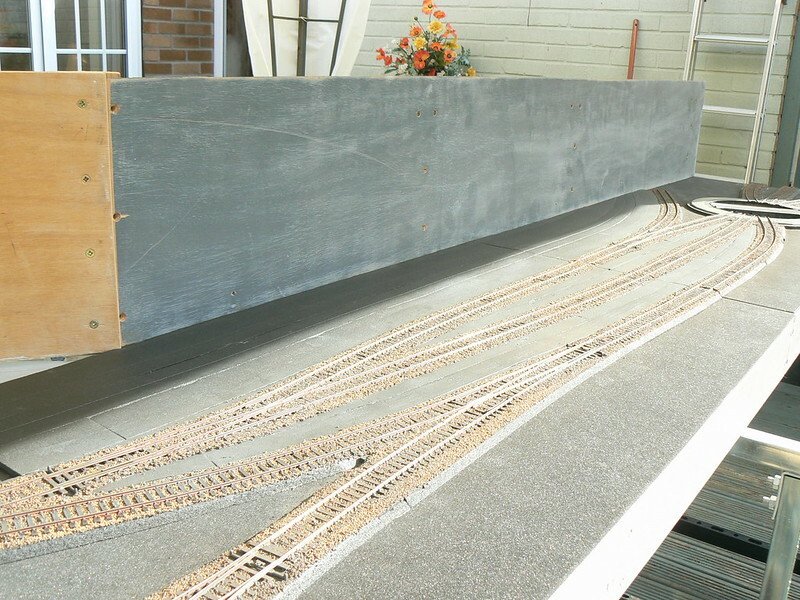 Thanks to a colleague on a forum who made the suggestion of having a removable section of track, this is how I plan to overcome this problem, probably the four copper-clad sleepers and four plastic ones on either side, complete with road bed and attached to a thin piece of plywood. 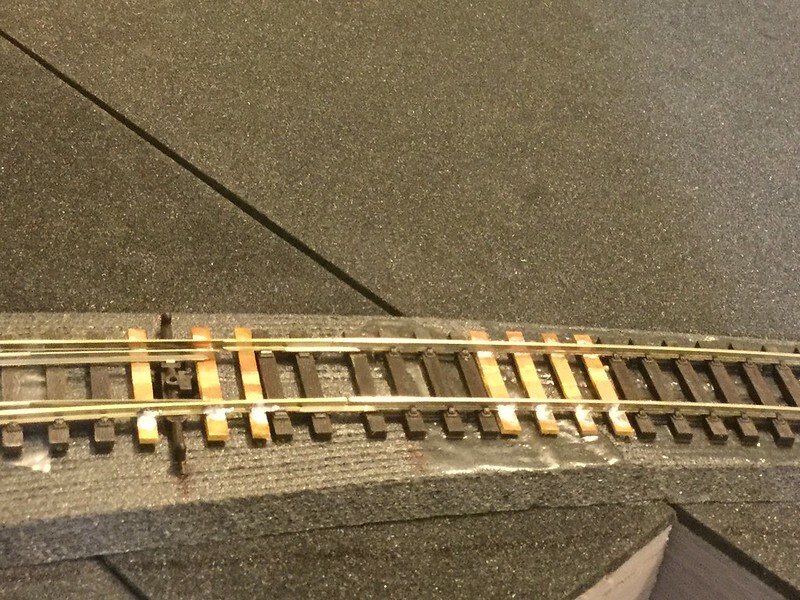 I used the Woodland road bed on my layout also on a removable section and have after 3 rebuilds still trouble with different heights on five (curved) tracks. 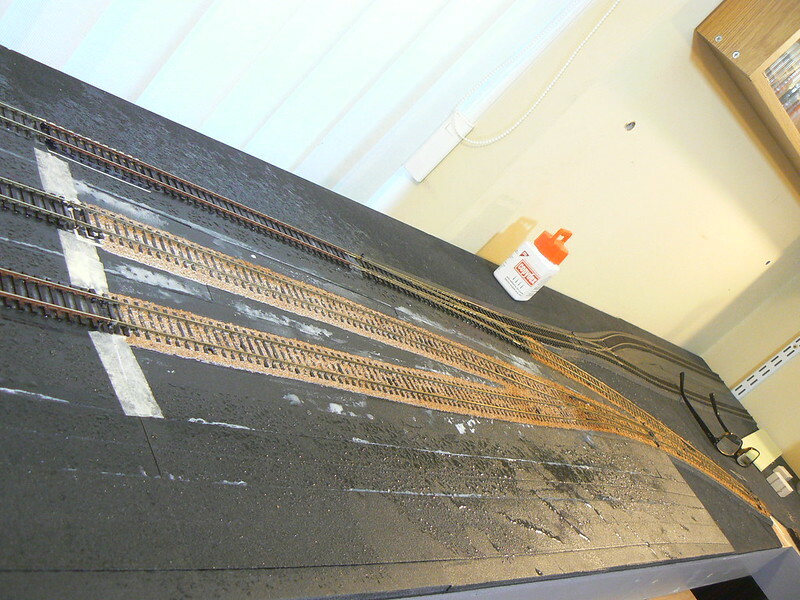 First time I laid the track on the road bed and cut it after glueing and ballasting with PVA. The second time I used the Woodland road bed again and cut it before laying. 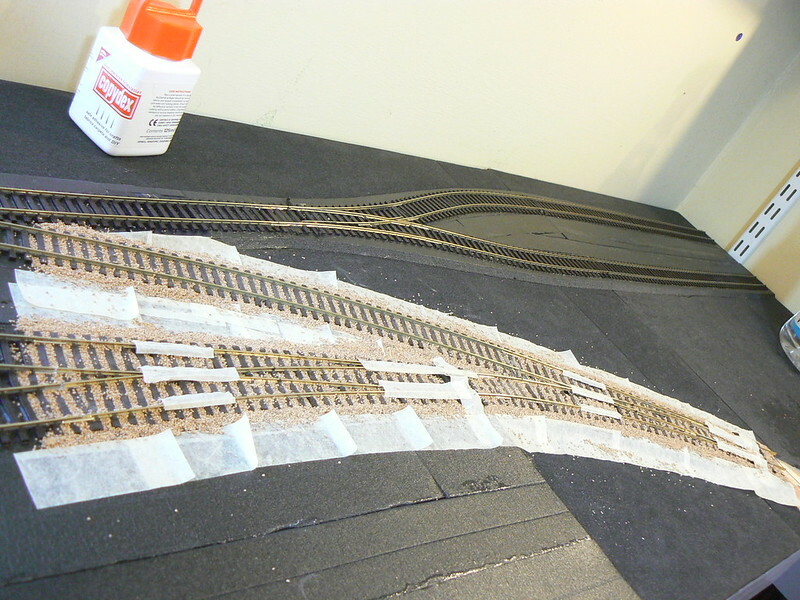 I aligned it very carefully horizontally and vertically before ballasting. After a few weeks I had a height difference of 1mm. Last time I used plywood at the ends (ca. 3-4 cm) instead of the road bed. After the glue has dried all was perfect. But sadly the same issue after a few weeks. Don't know why. The baseboards have the same height as before. Very dissapointing. 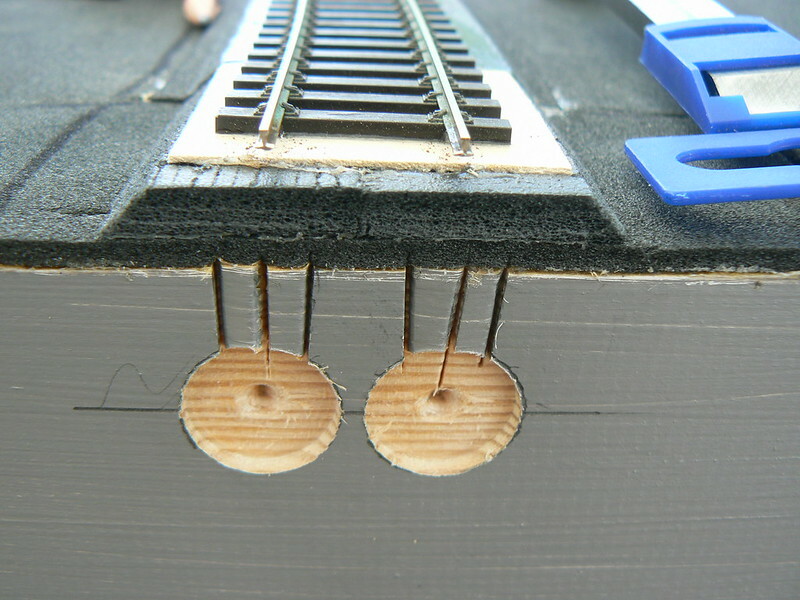 Now I will increase the height of the lower track by adding a piece of cardboard or plasticard between the sleepers and the plywood. 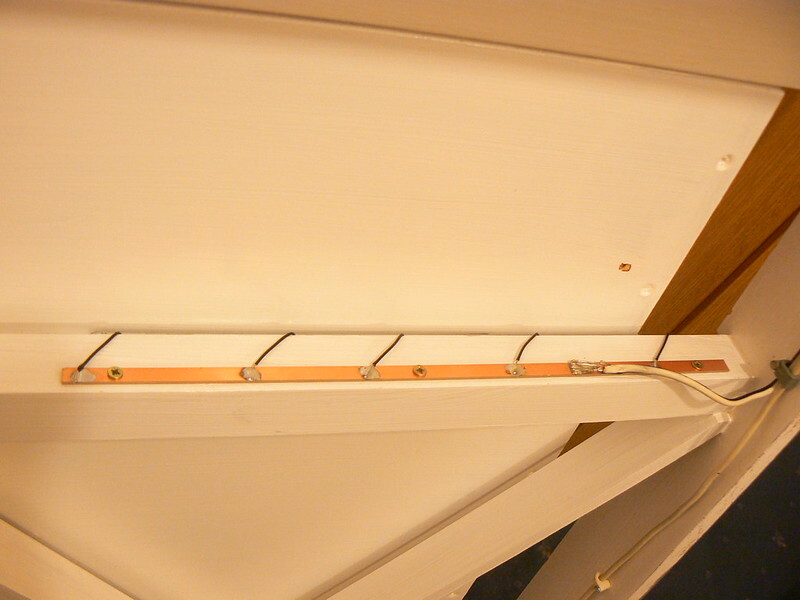 I think the removable track is a good idea especially if you have just one track over the baseboard joint. Oh! 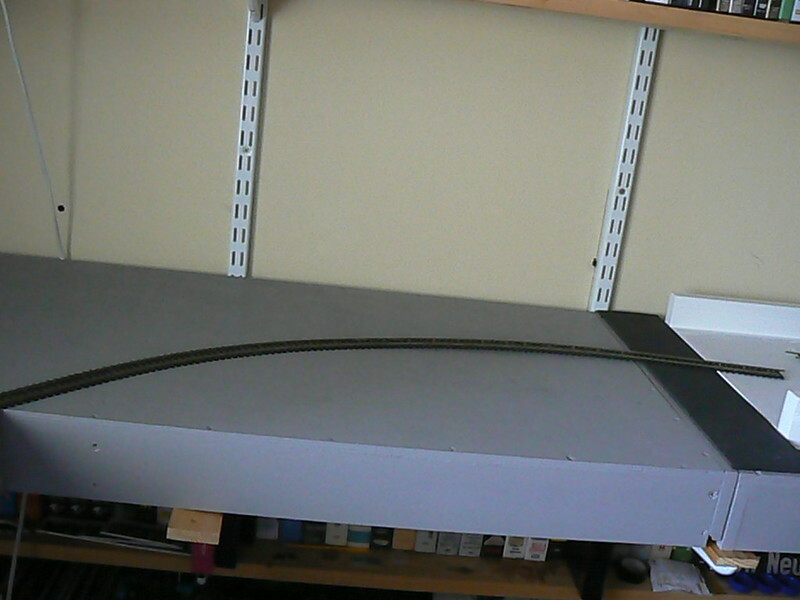 Another month or more has passed but at least, I have my initial track laid and (very) roughly wired in. Looking towards the turntable and loco shed. Looking along the line of wagons towards where the quarry will be, on left. 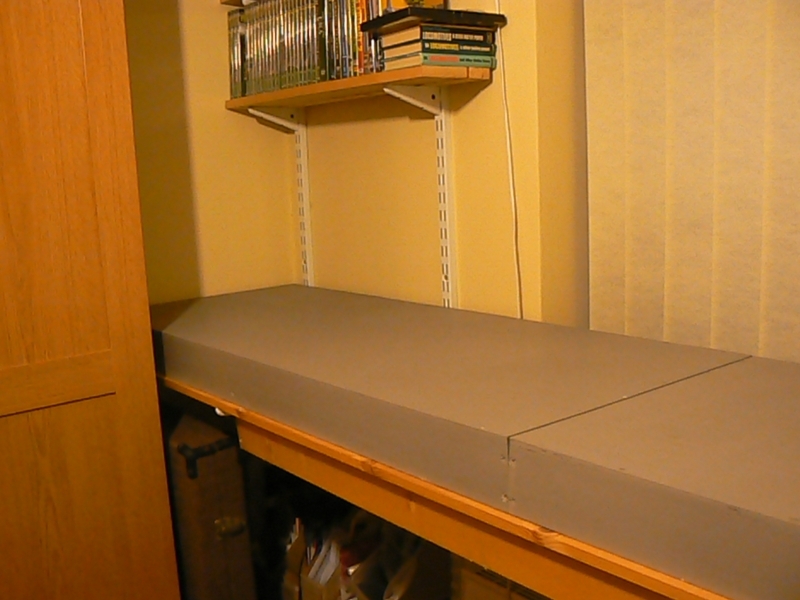 Here, you can also see where the wall mounted display unit, has been raised by about 8 inches. This gives a fairly level ‘clear area’ for the future backscene. 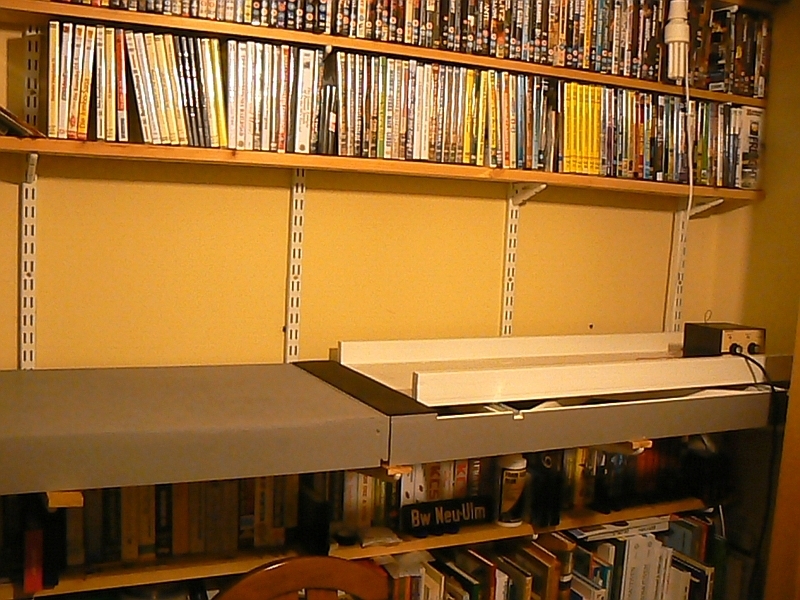 Believe it or not, raising this unit took a full days work, partly due to having to move and clear, adjacent shelves. Turning the corner, quarry behind. I think I have left this picture as a link - if you look closely at the enlarged image on Flickr, you can just see where I fitted the Kadee undertrack magnets. 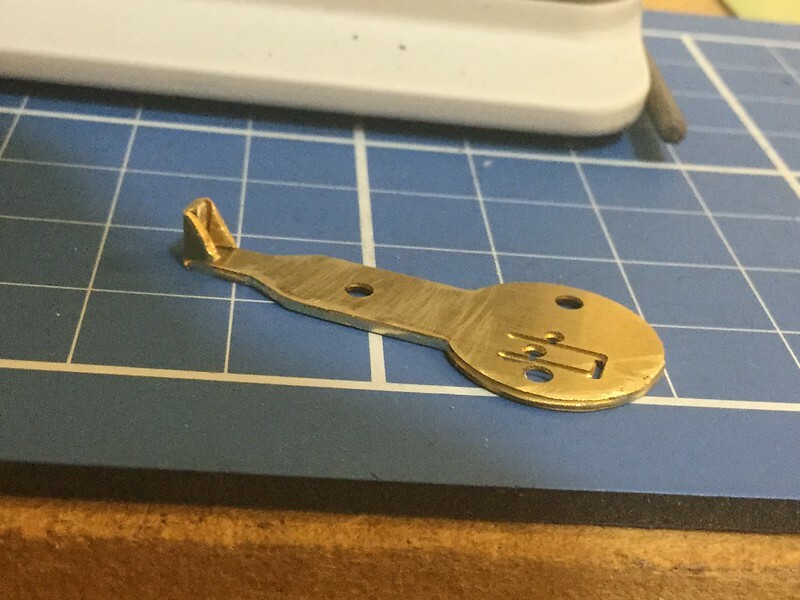 I did some testing and although they will still attract metal axles, they are sunk a little deeper than normal to try and reduce that effect, while still giving reliable uncoupling. I have spent a few days testing the track (of course!) and these big modern diesels worked fine. What I hadn’t counted on was the superb current carrying (& storing) capacity of these superb ESU diesels, they just rolled straight over any dead sections as though they weren’t there. Try even a big 0-10-0T let alone a tiny 0-6-0T and they stall all over the place! 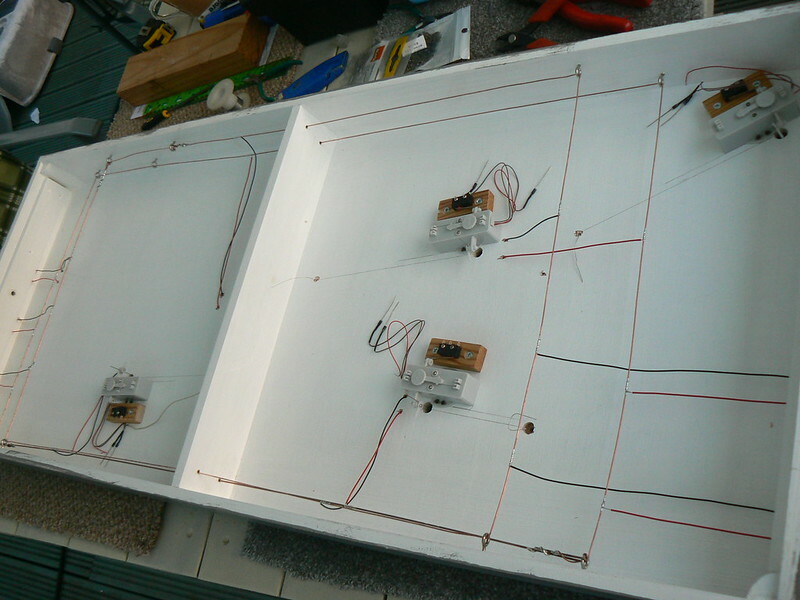 So, I now have to split the boards and turn everything over in order to fit point motors and micro-switches in order to feed the dead sections. 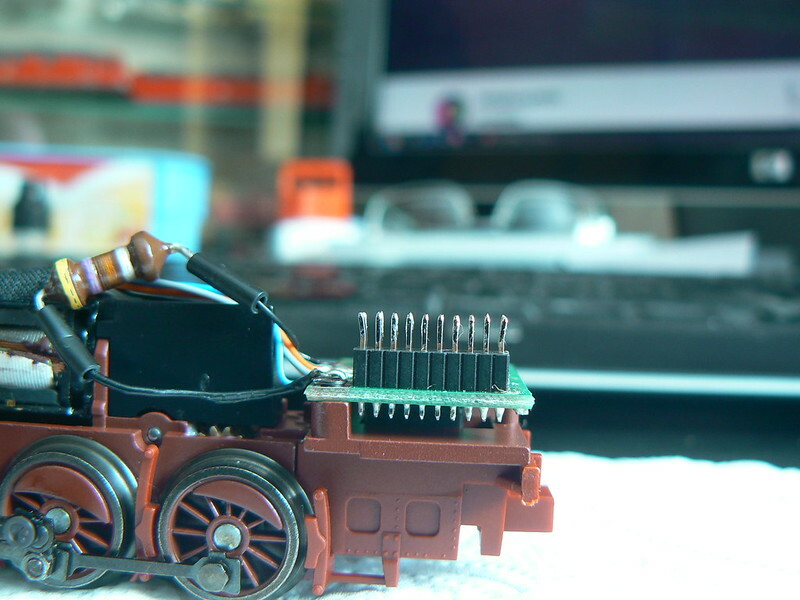 Only then will I be able to properly test the layout with the small steam power for which this layout was designed. Oops! Another too long a break between updates. To be frank, although there has been some progress, it has been of the brain numbing variety, which is why I’ve found it difficult to discuss it much. 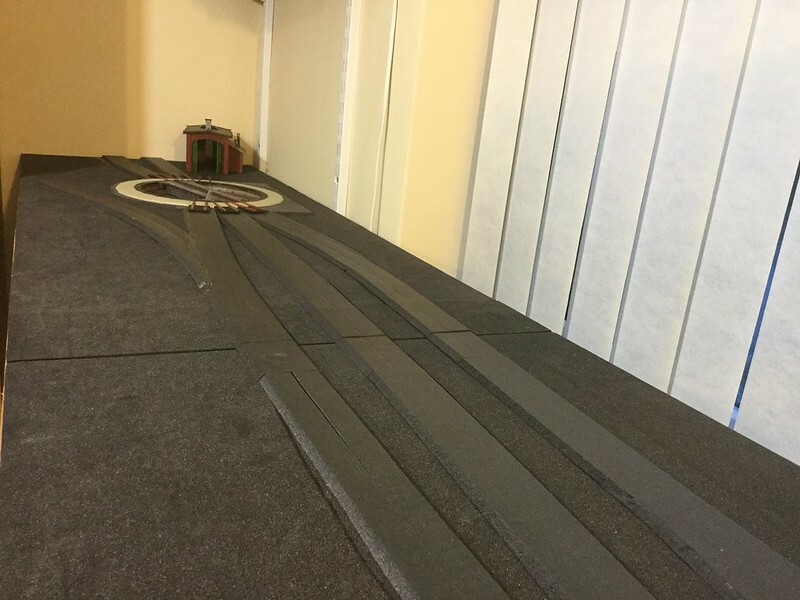 Once I had all the track laid and running moderately successfully, I gave the layout a bit of a shake down and was quite pleased with it. 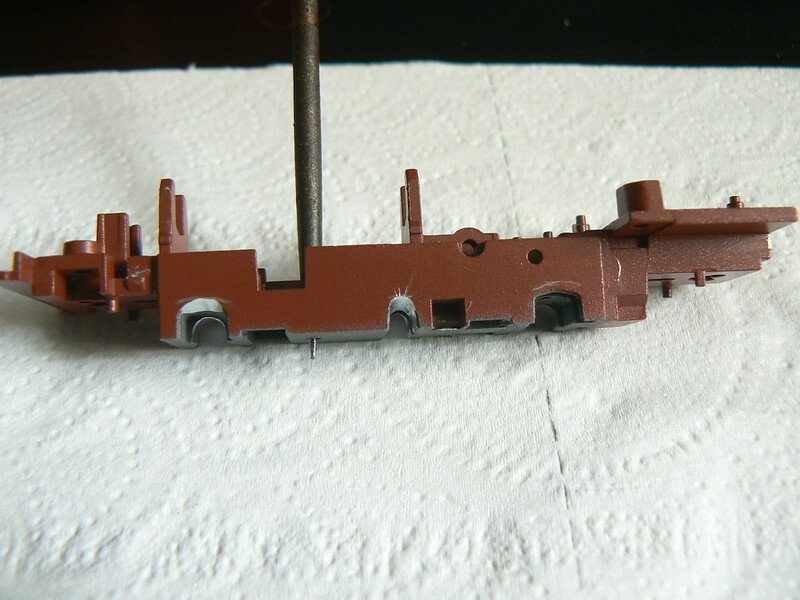 This did show that I needed to get the points motorised in order to be able to get the electrofrogs energised, so that my small steam locos can operate with some reliability. Splitting the boards with a view to working on them upside down, I realised that I needed to protect the ends of the track. My usual way of doing this is with ‘C&L’ track end protectors but it had been a long time since I used one. So, being less than careful, I managed to break the first two of my 12 that I had in stock, until I got the hang of bending them again. Then, I made a horrible discovery: I actually needed not 12 but 24 of these little blighters! Not only that but they were out of stock at C&L and everywhere else I could think of that might sell them, including eBay. I placed a “wanted” ad on one of my favourite forums and thankfully, a kind soul helped me out. Having received another six packets of these things, I set to work, cutting them out of their frets, cleaning them up, adjusting them so I can bend them to my specification, bending them, soldering and finally cleaning them up, it was then that I realised I now had too many!!! Yes, I need 24 in total not an additional 24, stupid man! D’oh! Oh well, they will come in handy for any future plans. 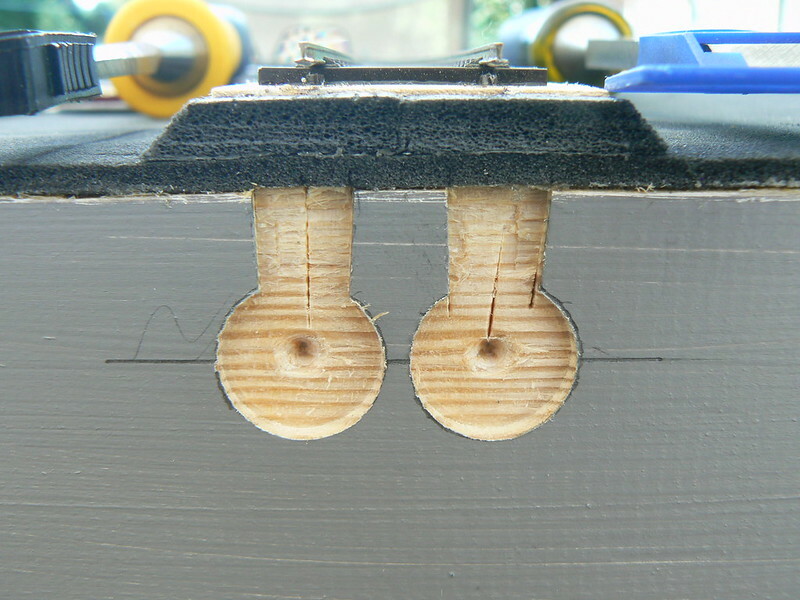 Now it came time to fit them to my boards/track and I realised that I could use a 16mm Forstner bit to help set them into my timber. 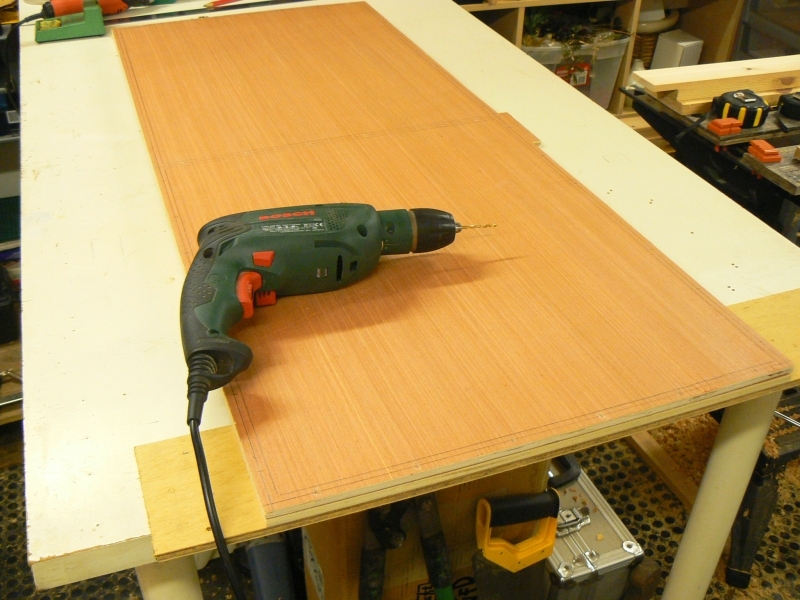 I do have the same size flat wood bit but the Forstner bit makes a much better job and I find, easier to control. A little bit of ‘Googling’ revealed that a similar building was built of yellow brick so I thought that would make a pleasant change from the supplied red brick so I set about a repaint. This also means that I must also repaint the loco shed, of course. 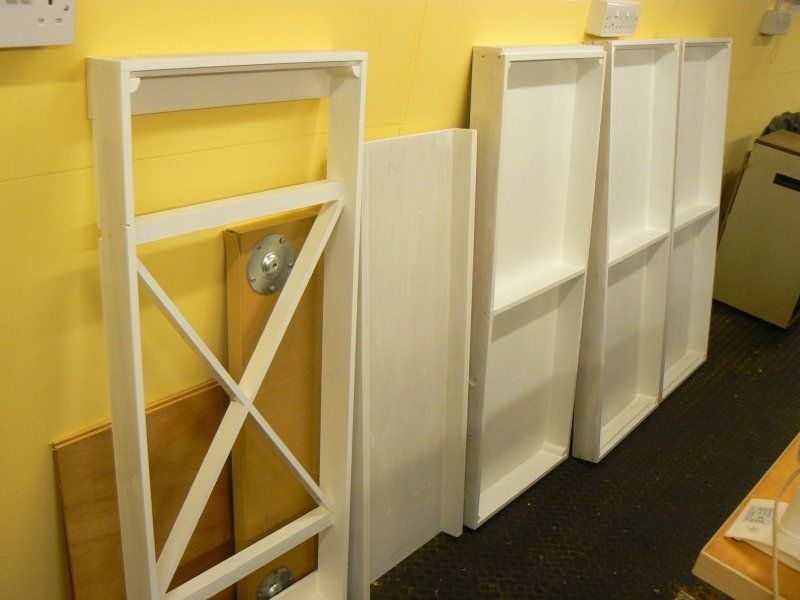 I also needed to paint the window frames as white window frames is a much more ‘modern’ thing. 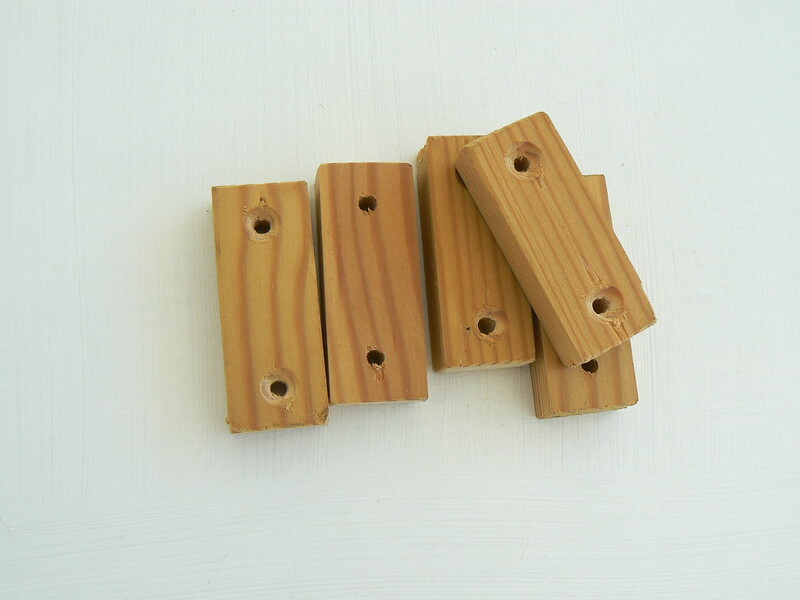 I chose dark brown ‘Oak Beams’ as a suitable colour as that appears to be similar to the pictured building and I have no way of knowing for sure what the original might be. With my business commitments dealt with, I determined to take some time to myself! So, on with these darned track end protectors (TEP). Here is a group of them during the fitting process. Maybe you might like to see how I go about this process in detail? Firstly, I use a finished TEP to roughly mark on the end of the baseboard where it is to go, not forgetting to mark the centre point with a slim pencil mark. 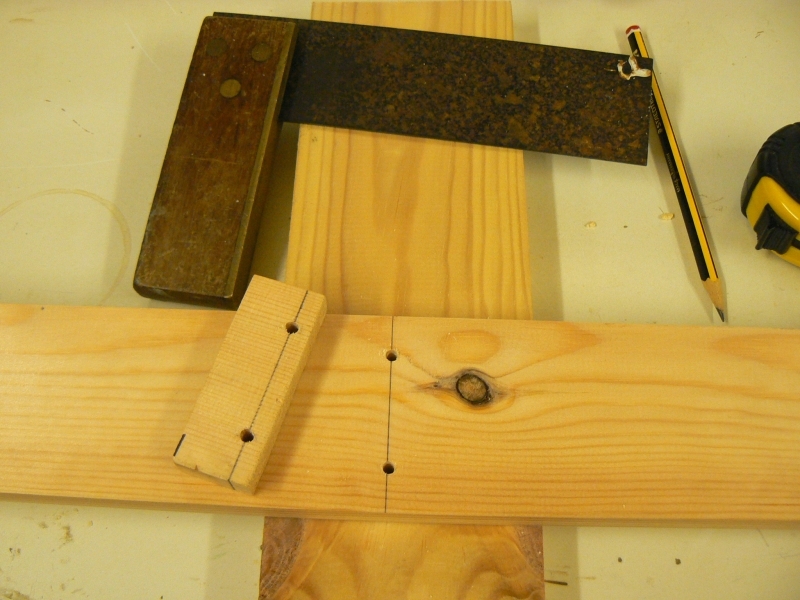 Then I use a rule to average out and true up any irregularities and then use a set square to line up with the rail. This gets me quite close but things still ‘move’ later on. 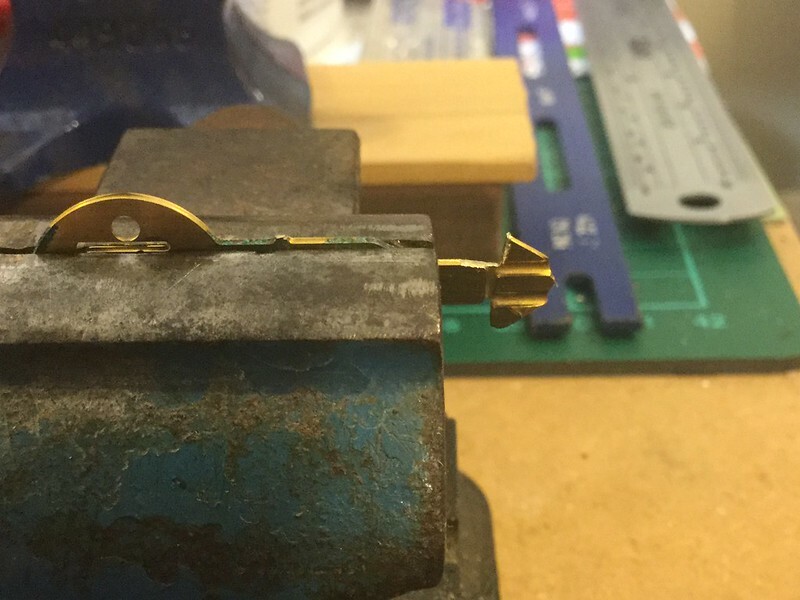 You can see the 16mm Forstner bit waiting to be used, just above my marking out. 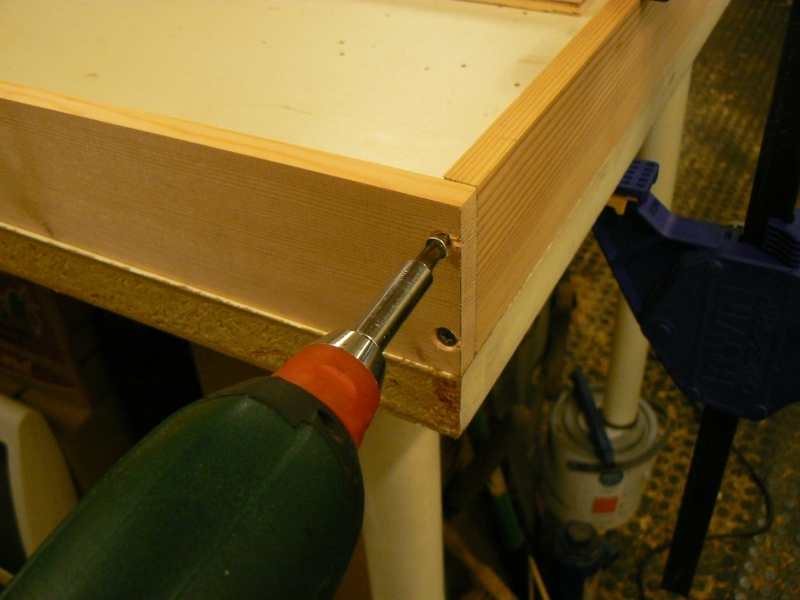 Having used the Forstner bit to drill out approximately 1.5mm of timber, you can see it leaves a much ‘flatter’ and neater base to the hole than a regular flat wood bit would leave. Notice the next two tools waiting to be used - recently sharpened wood chisels. Note: These were just posed for the picture, I would normally keep the blades sheaved until actual use as these tools are very dangerous indeed. 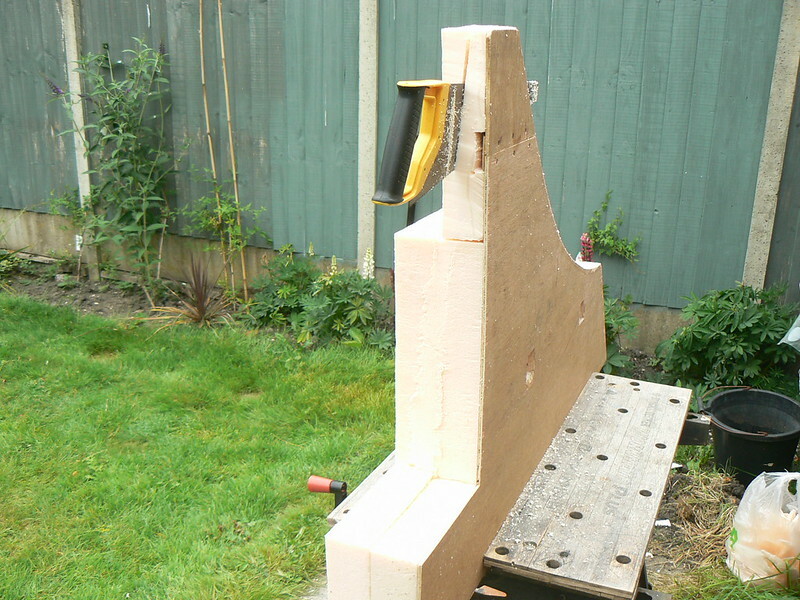 Initial chopping with the ½ inch Firmer chisel. After cleaning up with the ¼ inch bevel chisel. Don’t forget to drill through the timber to allow a wire to pass through. TEP screwed into position. I used very small 2mm diameter, 10mm long furniture screws. 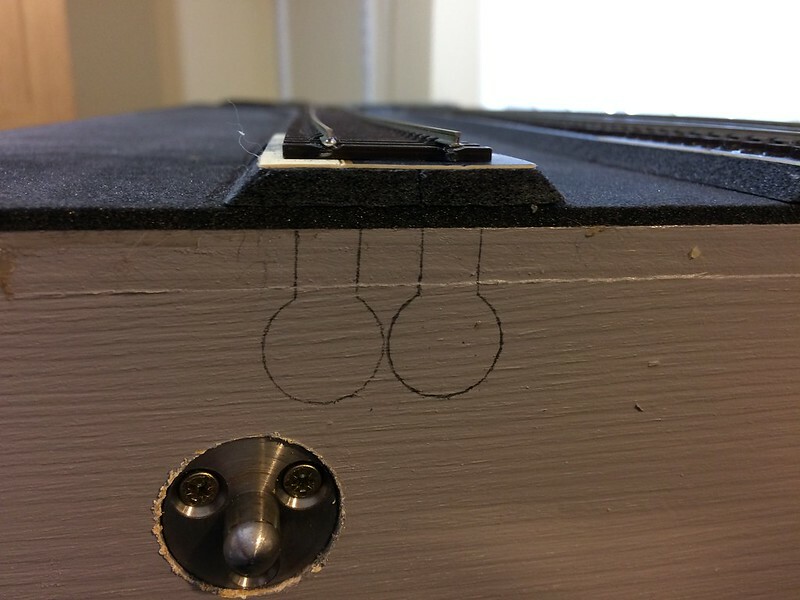 I prefer screws to pins as they are more stable. 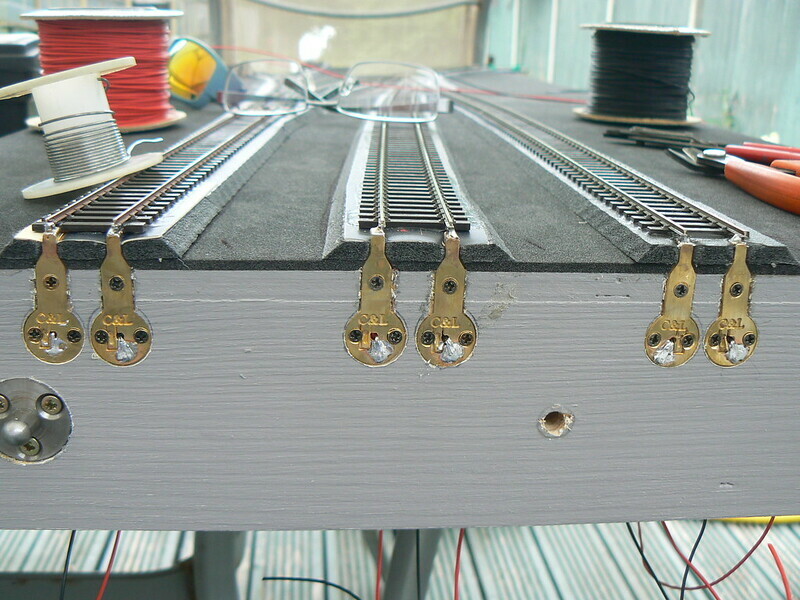 Rail soldered to the TEPs and track feeds fed through and also soldered. 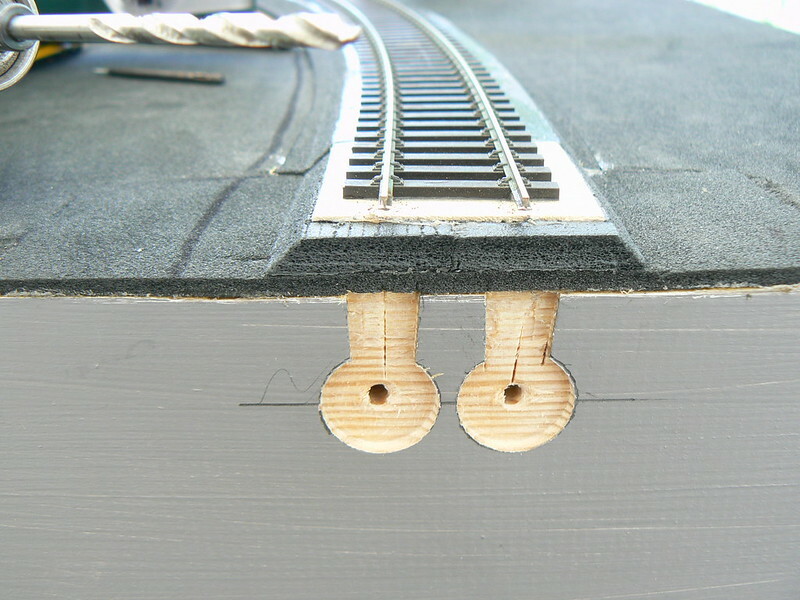 Total time to complete this one track (two rails/TEPs) would be maybe ten minutes, now repeat for each time a track crosses a baseboard joint! A decent afternoons work, complete with tea breaks (I am English! ), back-ache breaks etc. 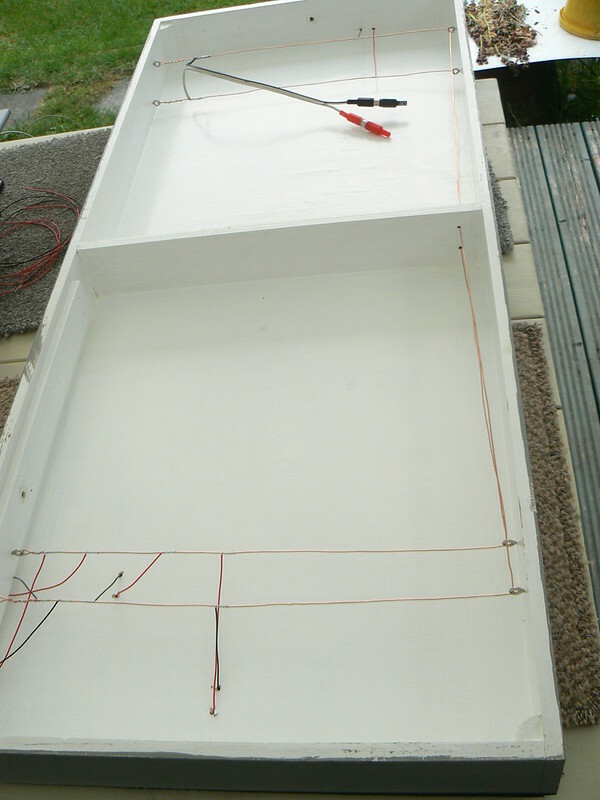 Now confident that I can handle the boards a little more ‘normally’, without dreading that I may catch something and rip out rails, I can get on with the wiring. 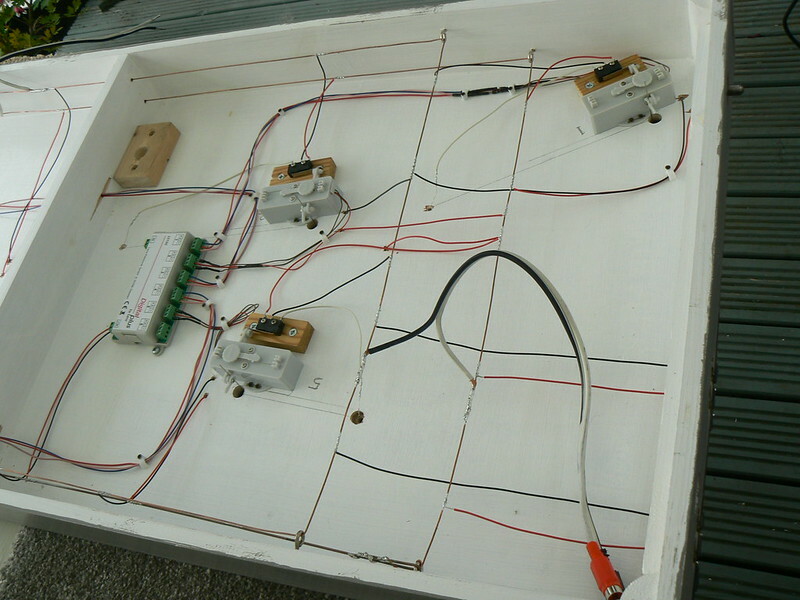 Here is the first board away from the traverser board, which had been wired a while ago now. Carrying on with my wiring work, I took advantage of the nice weather and worked outside, under the gazebo as it was simply too hot in direct sunlight! 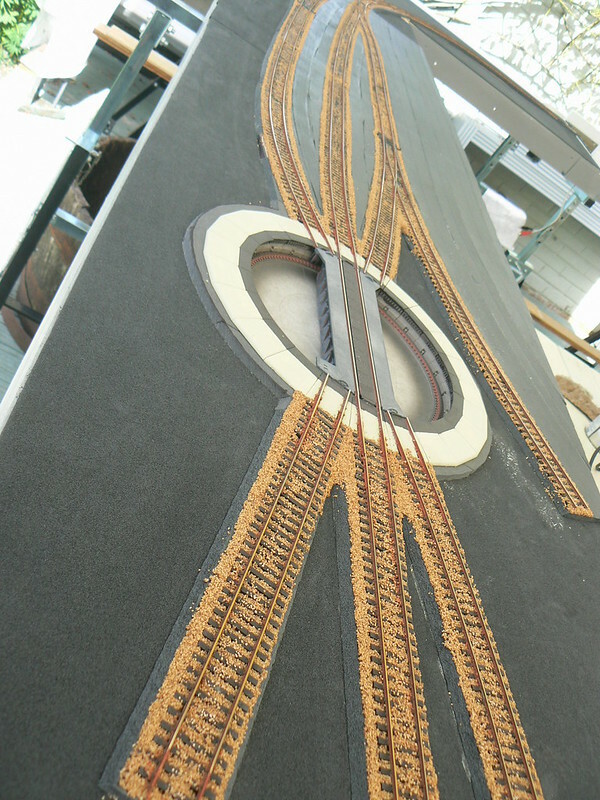 Here is the turntable board, again with a simple C shaped bus as that is sufficient for all the track feeds on this section. Almost out of shot is the first (Conrad) point motor that I installed. Now fitting the point motors on the ‘busiest’ board. I think you can just see my pencil marks where I plotted the alignment of the point above then it was a simple case of lining the motor along these lines and getting the actuation lever in the right position and voila! Screw the motor into position and set the actuation wire, I always use the thicker wire supplied. 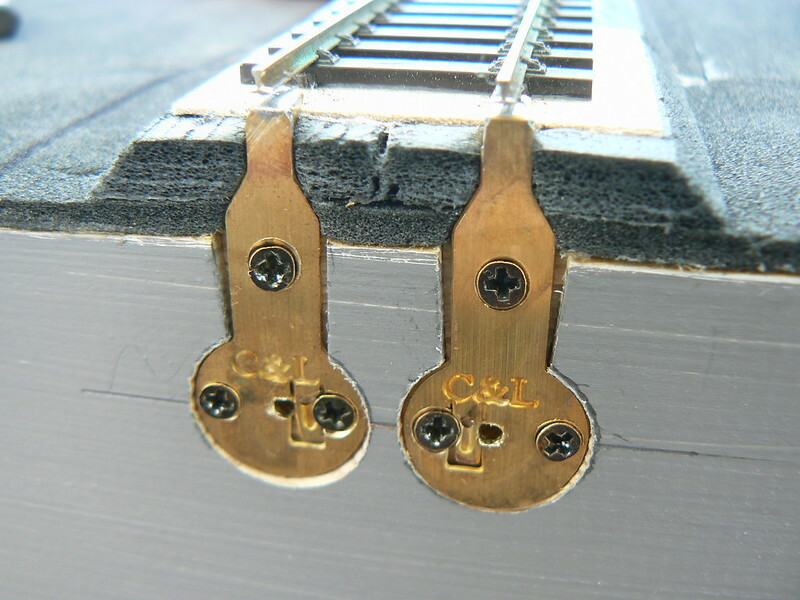 I knew that my micro switches would need elevating from the baseboard surface so I found a piece of strip wood that would just slip under the motor actuating lever and got them prepared. 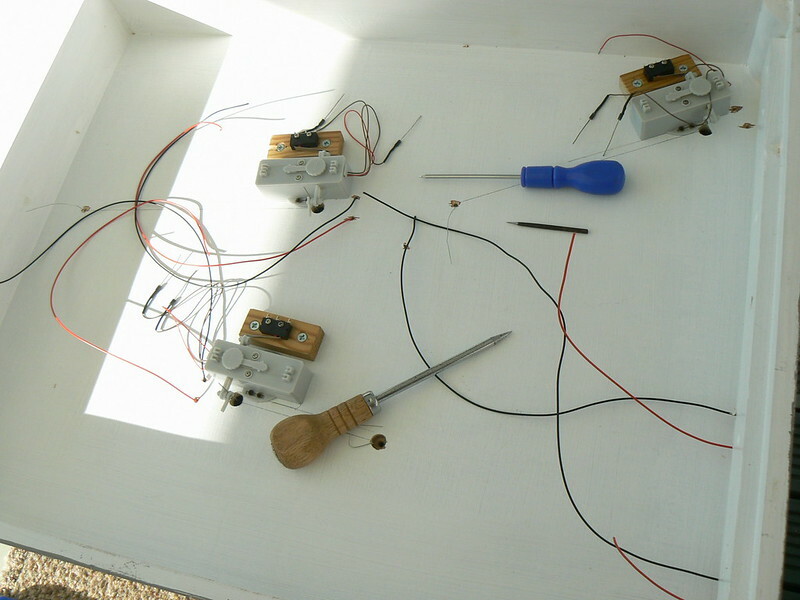 Fitting the micro switches into position, all that was required was to ensure the point motor actuation lever was able to operate the micro switch arm. Curiously, I had some smaller switches in stock but these larger switches seemed to work better. Having now done most of the physical work under the boards, it was now time to fit a full wiring bus. As this final board is quite busy, I made full loops all the way around the perimeter of the board. 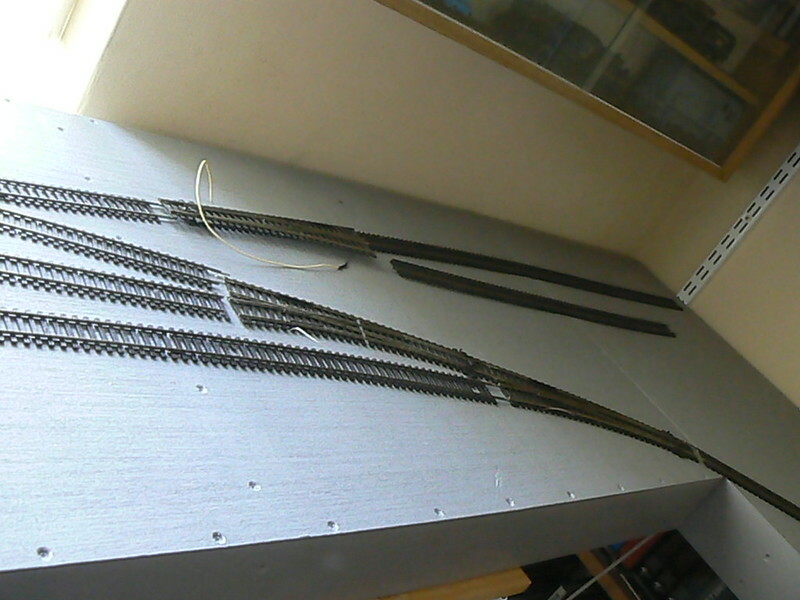 Here we have most of the track feeds in position, later I realised that I had missed a couple of track feeds when doing the droppers, despite drilling holes for them. Just a close up of the above, you can actually see one of the holes where a track feed should go! Looking a bit more complex now. Most importantly, the Lenz LS150 accessory decoder is now fitted along with connections to all the points, including the point on an adjacent board and the micro switches are all fed from the bus and to the point crossing vee. My good friend Les, gave me some assistance with making the micro switch connections as all I could reliably do was the ‘common’ feed to the vee. Without Les’ help with identifying which of the red/black wires goes where on the micro switch, using an electrical tester, I would have spent ages trying first one way, then the other - I really am that electrically incompetent so “Thanks” to Les! Also, the bus feed and inter-board connections are also fitted. I probably over engineered these as they are sections of heavy duty HiFi speaker cable soldered to both outputs of HiFi/video Phono plugs and sockets, red and black to correspond with the bus colours. I had no idea this job would take quite so long! 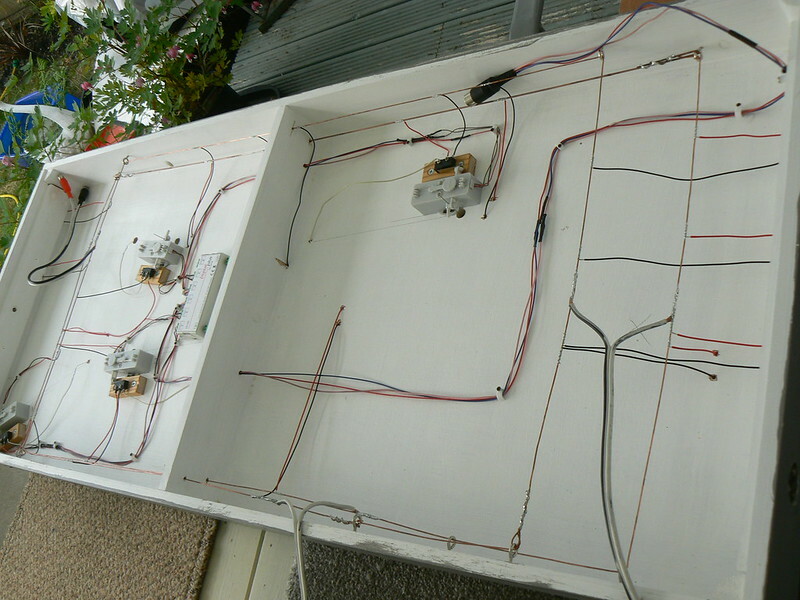 Principally because I have never gone so far with a project such as this - all my previous layouts have either been simple power routing though the point or ready built. If I had tried to wire a layout like this using traditional analogue methods, I would have been stumped as it would have been too much for me. Using a bus to provide two wires to each piece of track - that I can deal with! I would say that I worked for an average of over six hours a day for ten days, doing this - I am sure that others, more experienced and who know what they are doing, would be much faster. But, I am satisfied with this and bar one minor adjustment to one point, everything worked first time. 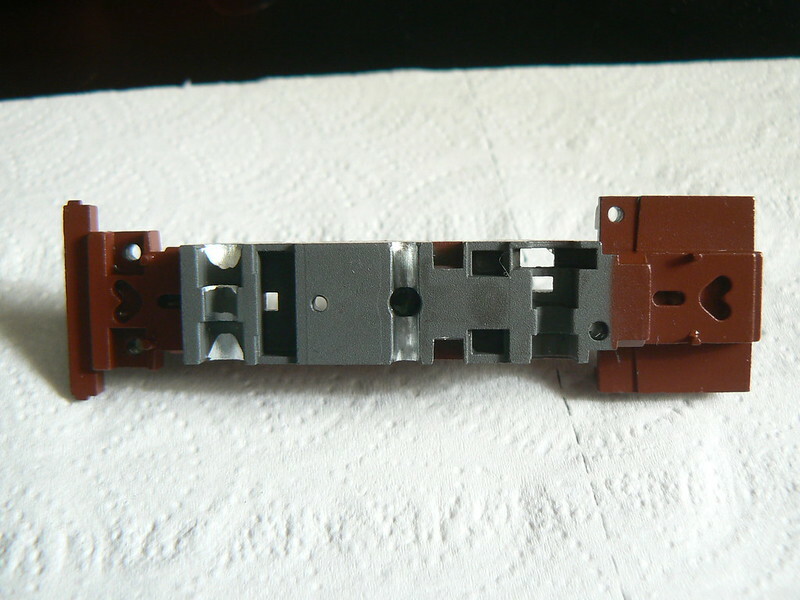 Having apparently completed all my wiring work, my attention now turned to ensuring that my current smallest loco will work on the layout. The whole point of a small layout being the use of small locos, surely? The machine I am speaking of is a Trix T3 0-6-0 tank engine and ‘cute’ is a fair description of this one as it is only 98mm (4”) long. I had read on German forums of a trick to alter the rigid suspension and as, on it’s previous test it had not performed sufficiently well for me anyway so I resolved to do some work on it. Here is the chassis stripped right down to its bare bones. Please ignore the metal rod poking out of the top - it’s just a sharpened sewing machine needle that I use as a fine scribe but here, it is balancing the chassis on its side for the picture. 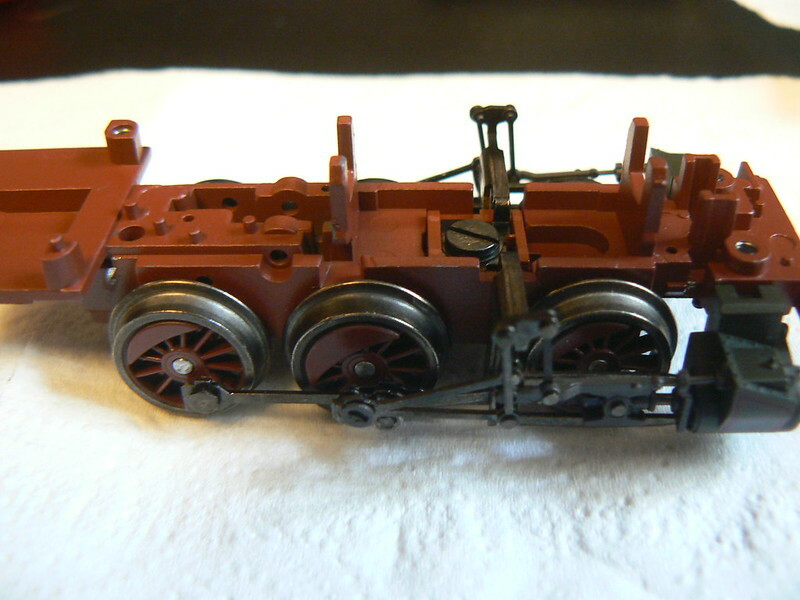 The loco is powered via its rear axle so that must be left alone but I made marks on the chassis approx 1mm above the bearing area. 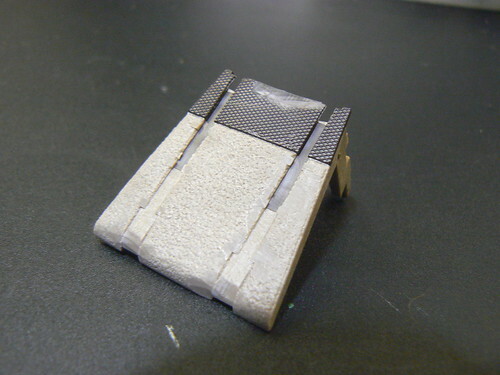 Then I carefully filed away material of the chassis (bearings), to the depth of my marks. Note that the centre axle has a recess for a spring. Yes, the Trix T3 does have a sprung centre axle! (I had read that it doesn’t). You can now see why the chassis has to be stripped right down as you really don’t want metal filings getting into the motor or the gears. Simply checking that the filing work is done. Testing the rolling chassis. A point to note here is that clipping the plastic keeper plate on now is a bad idea as the gears still need to be added and one of their securing pins is not accessible with the wheels secured by the keeper plate. Fortunately, finding this out the hard way didn’t cost too much time but it did result in more handling of the delicate valve gear - which caused stress! Rebuilding the motor/gears and circuitry. 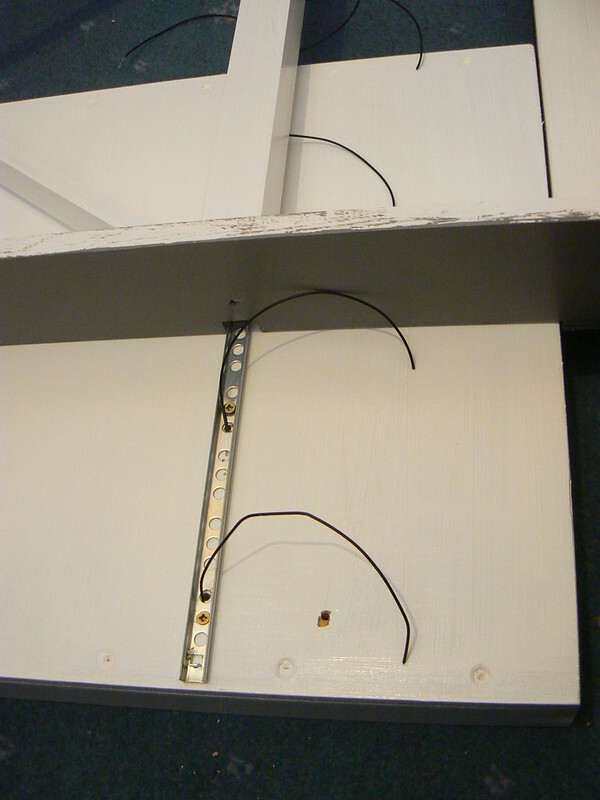 I had noticed the original pick-up wires were slightly too thick and had become trapped by the body so I replaced them. Now I was ready for an electrical then driving test - not so much a disaster, just a damp squib! 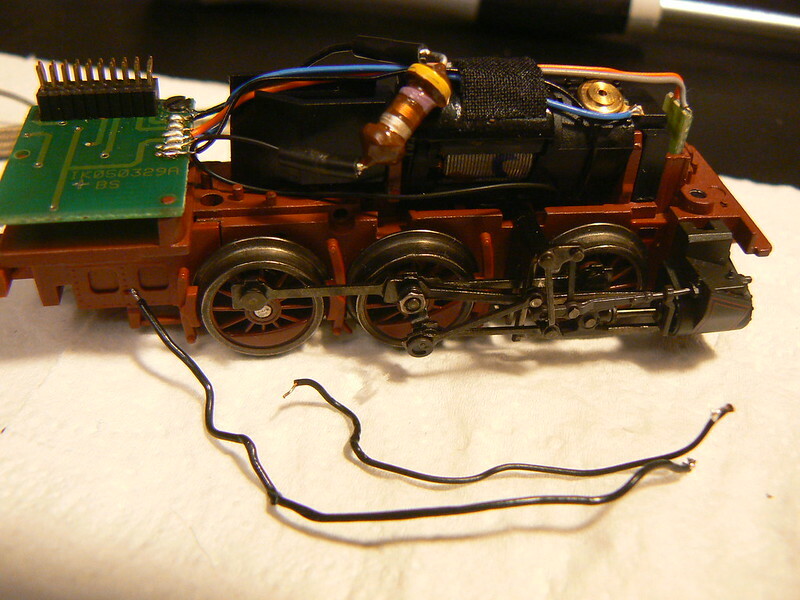 Reading the decoder/loco on my programming track - nothing was working at all, it was completely dead. Was it the decoder or what? No, the decoder was fine. Changing the decoder for a blanking plug and testing on my analogue track showed there was a very intermittent electrical contact - somewhere. I used a ‘buzzer’ to check all the pick-ups and slowly narrowed the problem down to the 21 pin decoder socket. 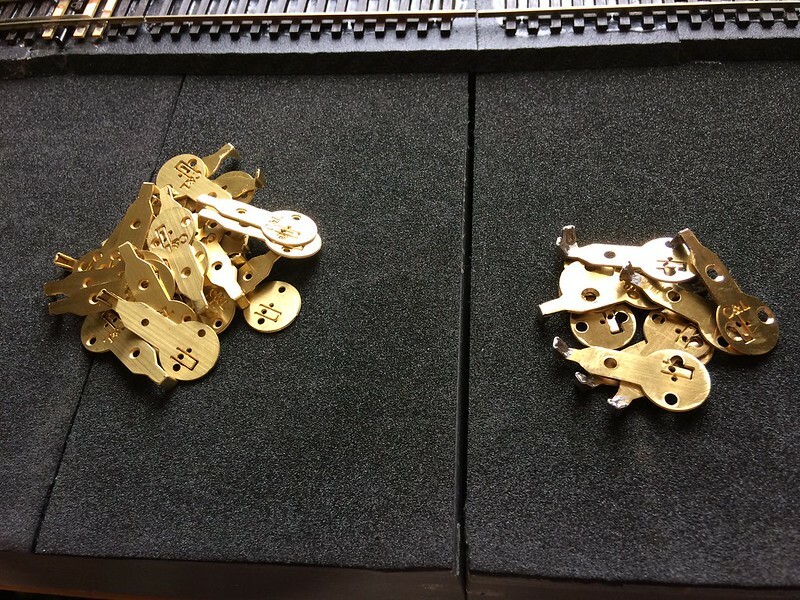 It seemed that some or all of these very fine pins were loose, something that I don’t recall previously finding. I decided that tinning all these pins with solder might do the trick and it did. 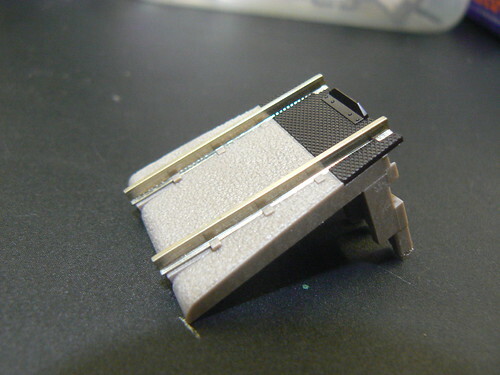 The offending 21 pin connector with solder tinning. 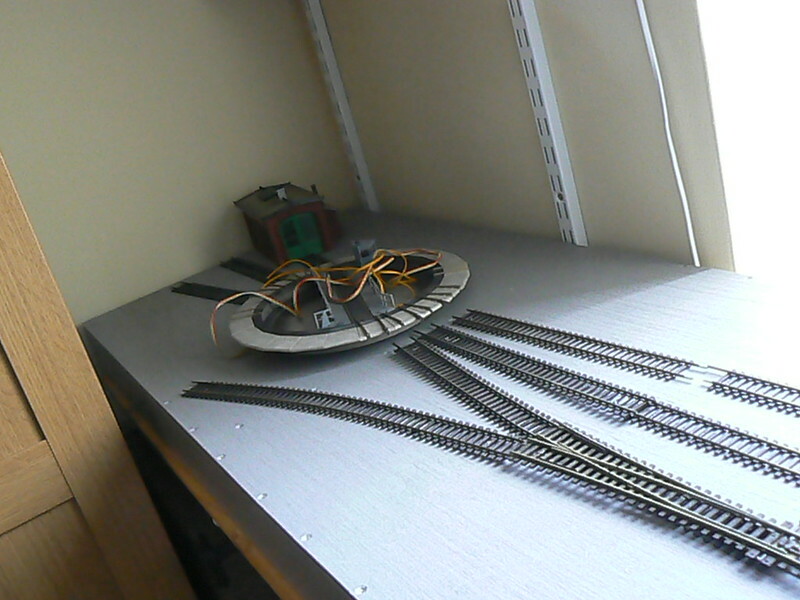 Having re-fitted the decoder and testing on the programming track, everything appeared fine electrically. At last, I could test run the little T3 on my layout and I’m very pleased to report that she performed very well indeed - as a chassis. 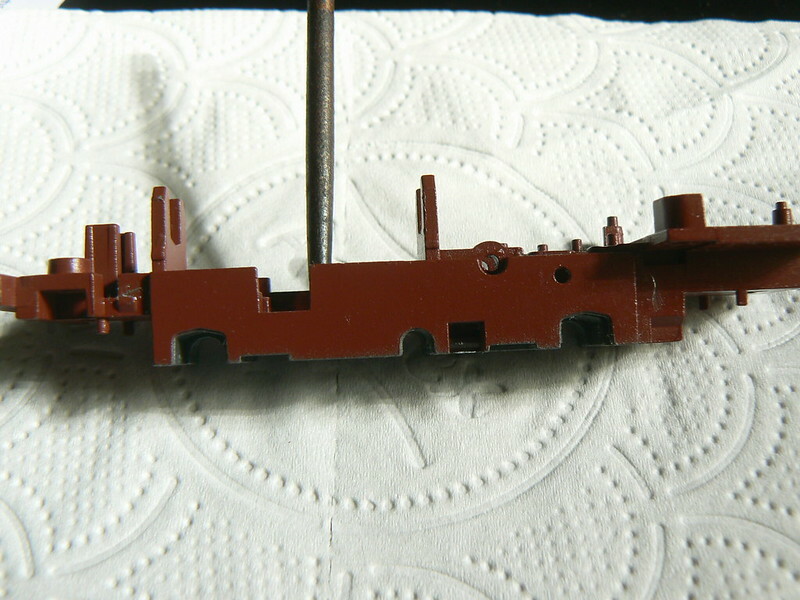 Confirming that all appeared well, I now had to add thread lock to the tiny nuts that held the valve gear in place, secure the wiring and put the body back on. This more than doubles the weight of the loco to 125 grams, so better testing can be carried out. Here she is crawling over a point without hesitation at speed step 1. It’s difficult to tell and there is really not that much movement but here she is riding over a shallow obstacle, a scalpel blade. I think she’s ready for service. Oh dear! Another long time between updates. My excuse is that I have simply been too busy to write anything! Now that I am taking a short break, I can do a catch up although I’m sure I missed taking some pictures that may have helped explain things. 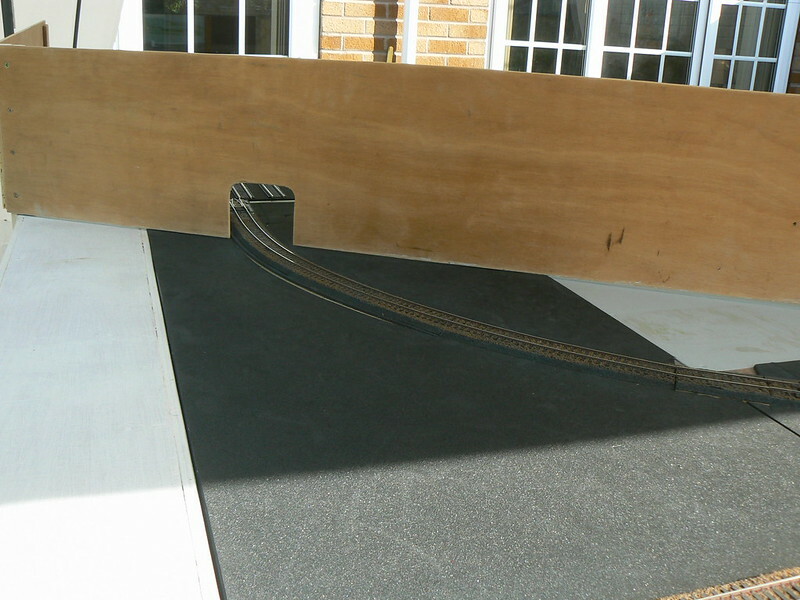 Firstly, I built a small triangular ‘filler’ board for the corner where the layout turns through 90 degrees - this provides a base for some scenery beyond the railway itself, supports part of the backscene and hopefully, provides a way of getting rolling stock onto the traverser (more on this later). 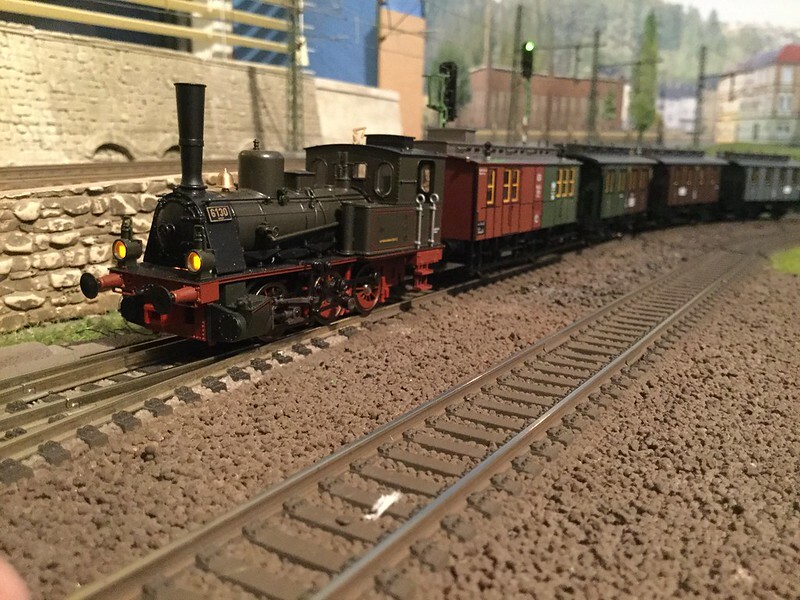 Now the weather had turned threatening so I re-assembled the whole layout in my box-room and gave my Prussian motive power a running test, this was very therapeutic and enjoyable. 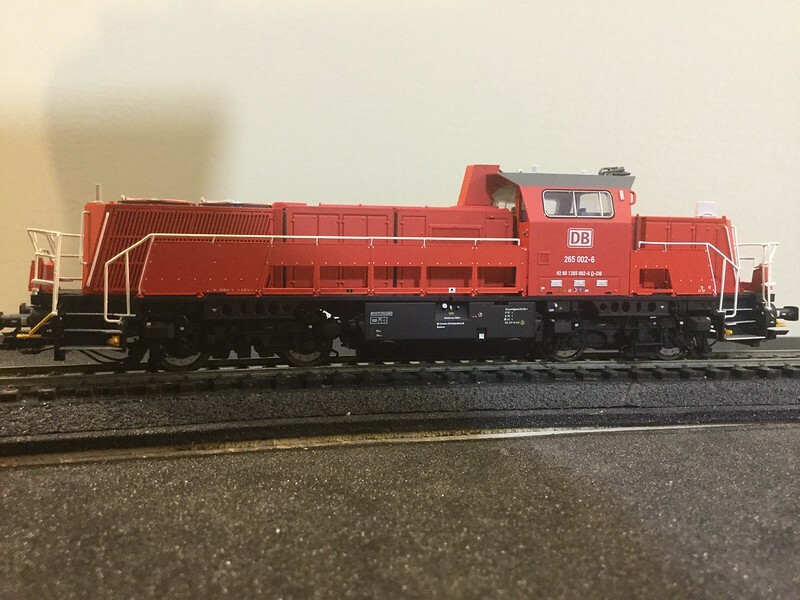 It also served to show that certain of my locos are unsuitable for use on the layout, sadly the lovely Weinert T13 0-8-0T is of too rigid a wheelbase to handle one short but tight curve and my Roco T14 2-8-2T is just too poor a runner - no real surprise there. 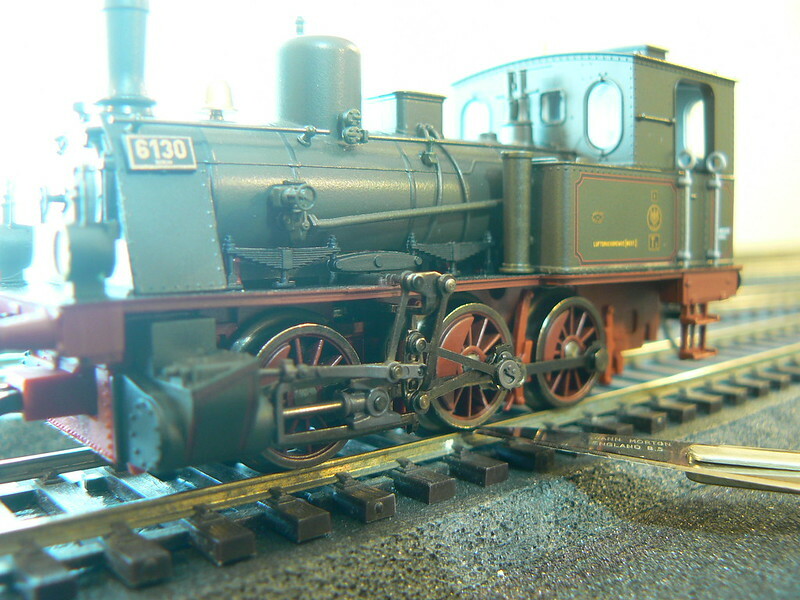 Also, few of my tender locos will be suitable as they are too long for my little turntable. My scenic expert, Doug had lent me some plaster cast samples of various items, including some lovely “old fashioned” platform sections. 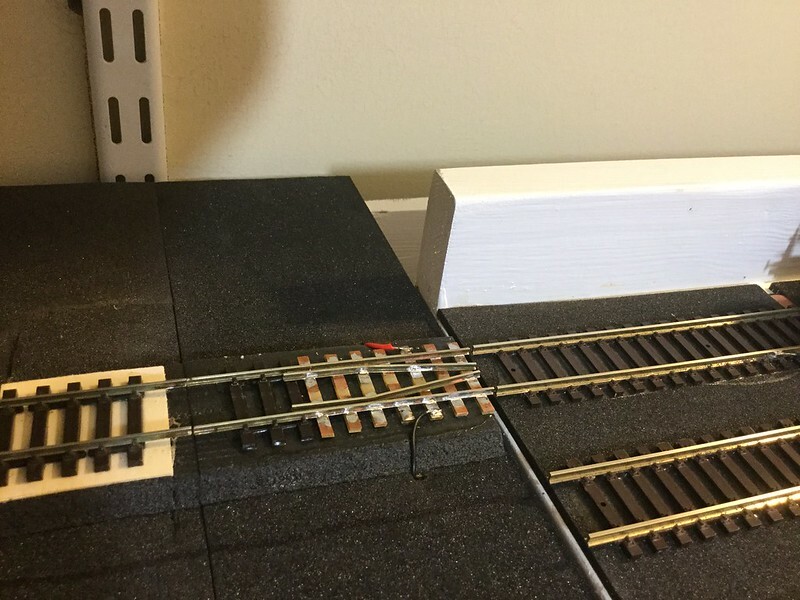 These showed that I needed to raise the area around where such items will be installed so I built up the area using strips of Woodland Scenics roadbed. 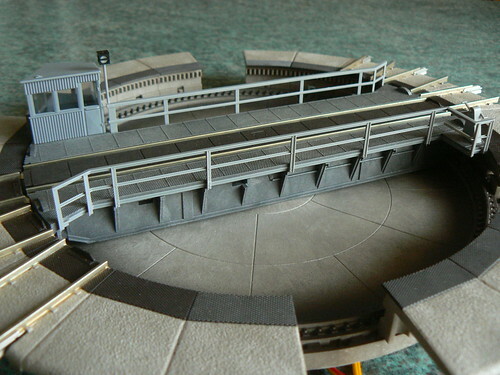 Once this was done, the platforms looked much better. Now, I had to tackle the job that so many folk hate - the ballasting. 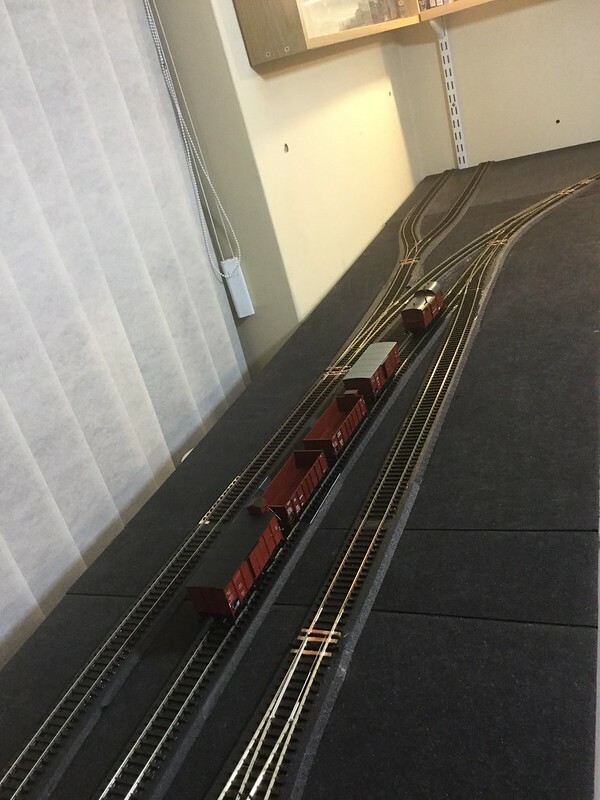 By now, time was running short and I had to get the layout to a certain state before I could take it to my very good friend, Doug’s house so that he can work his magic on the scenery. So, I had to get a move on! I decided the least tearful way of doing the ballasting was to simply mask everything off where I didn’t want any ballast to appear. 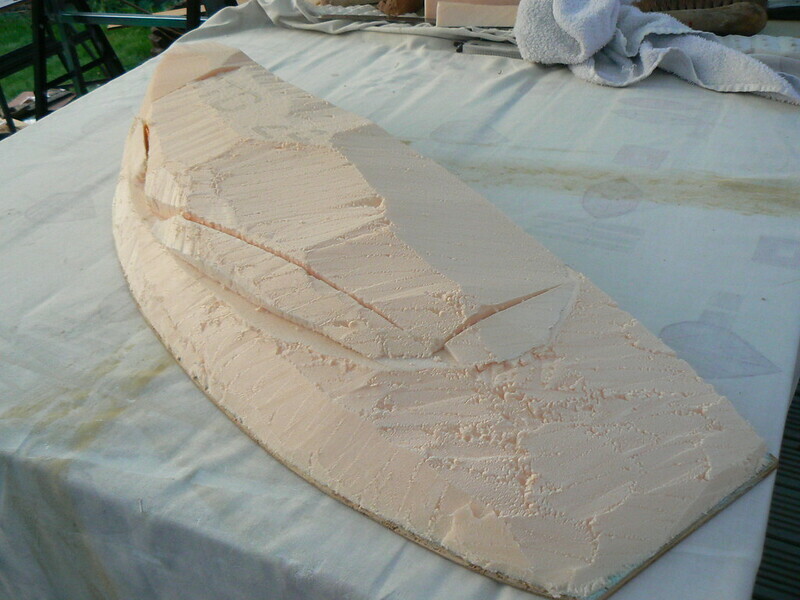 Once the masking tape was in place, it was a simple matter to use a small spoon and apply the ballast. Now, I have had some dreadful experiences with ’real’ stone chippings in the past so this time, I am using C&L lightweight ballast, which I believe is made from crushed Apricot stones - it is supposed to be quieter than regular stone and was quite easy to apply. It seems much less abrasive of the finger ends as you work it into position. 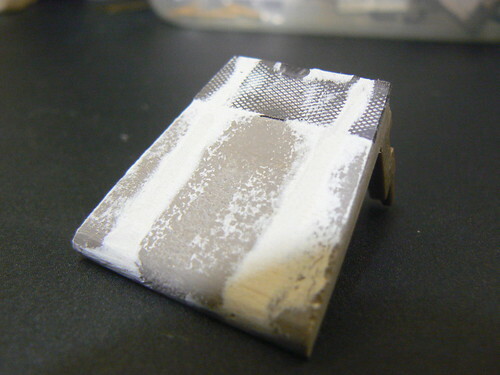 Once in place, I lightly moistened the area by gently spraying with ‘wet’ water, then applied diluted scenic glue from Woodland Scenics that does not set hard. 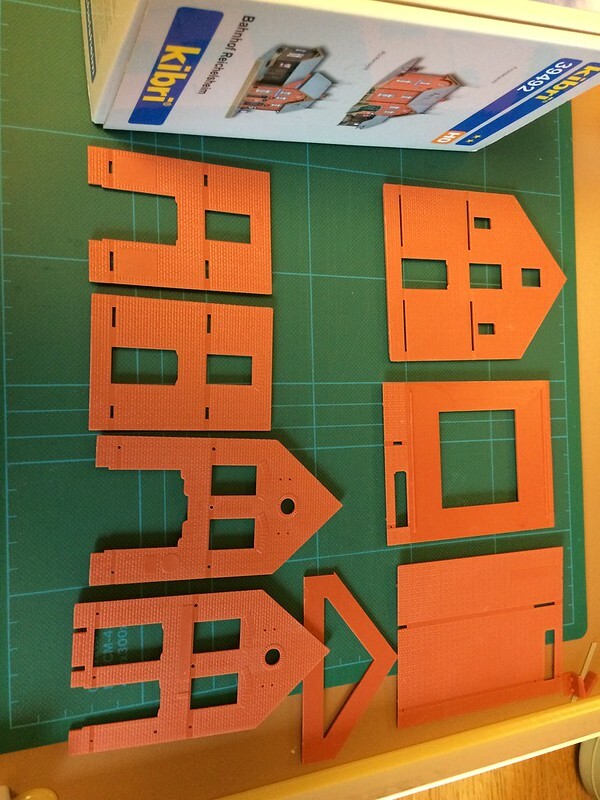 The trick now is once the glue has seeped into position - get the masking tape off quickly as it is a nightmare once everything has dried in place. By rinsing each piece of tape in a tub of water as it came off the board, I was able to recover quite a lot of ballast too. No sense being wasteful, I always say. 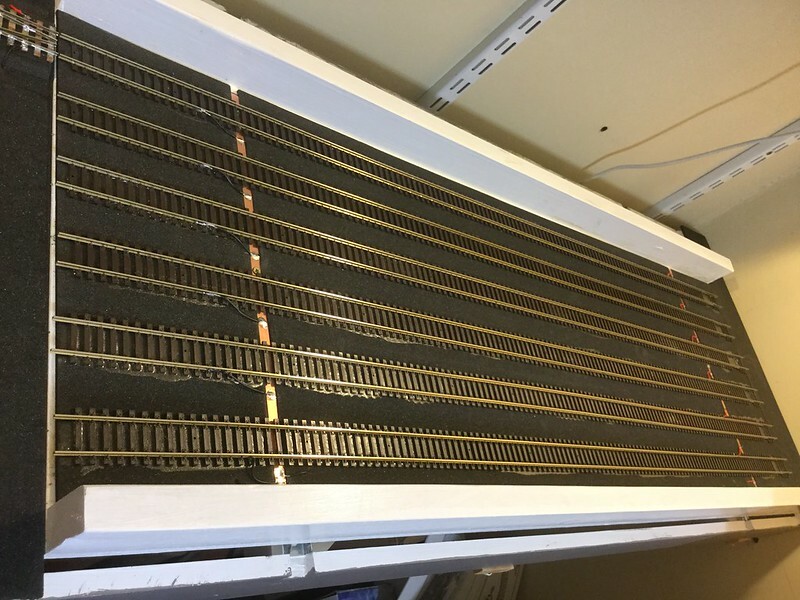 Amazingly, each baseboard must have taken at least 8-10 hours to ballast but that includes all the cleaning up of all the rails after each session. 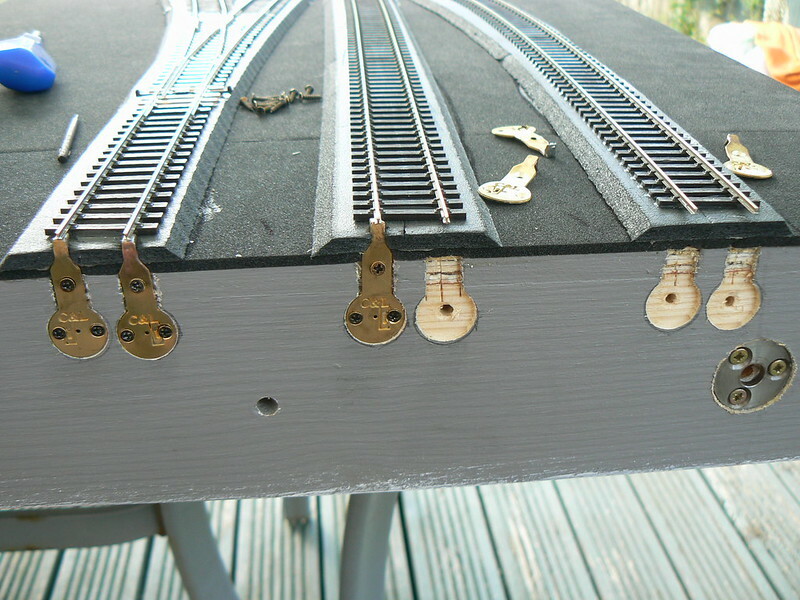 Before I painted the sides of each rail with rusty coloured paint, I spent some time cleaning off the little pieces of grit that had glued themselves to the rail, this was another rather tedious job but worth it, I feel. The beauty of working on a portable layout is that it is so easy to separate the boards and turn them around to gain easy access to each side, saves a lot of backache. 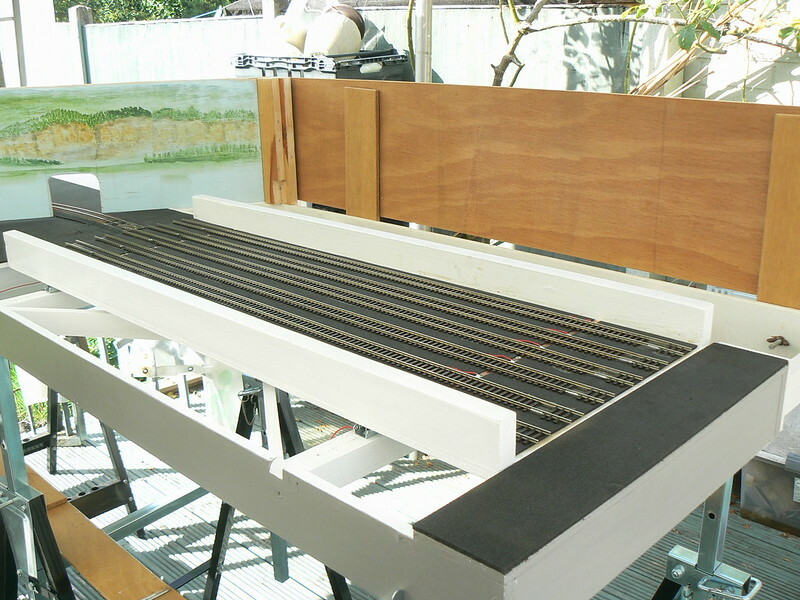 In anticipation of this job, I had invested in a “Rusty Rails Painter”, a miniature paint roller with a drip feed type applicator. 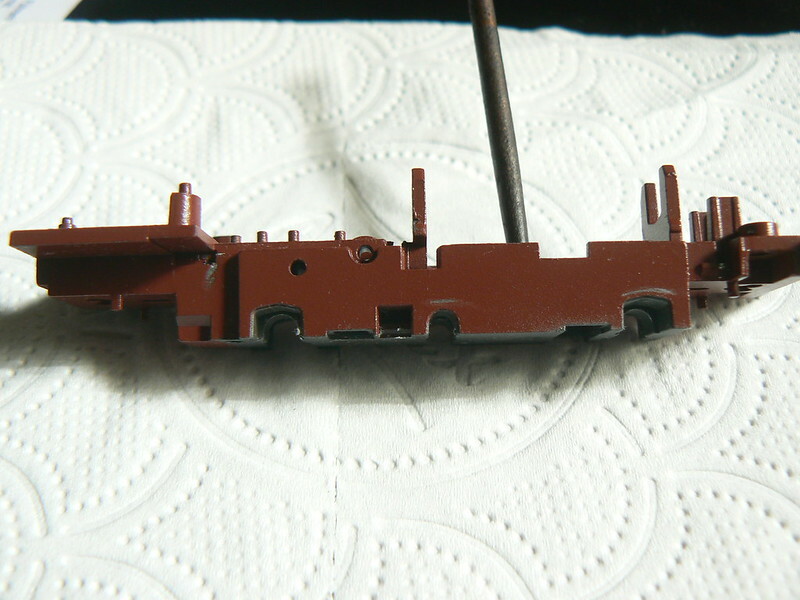 This made painting the rail sides go very much faster than when I’ve used a brush previously. However, I still used a brush to do the finishing touches on the points. 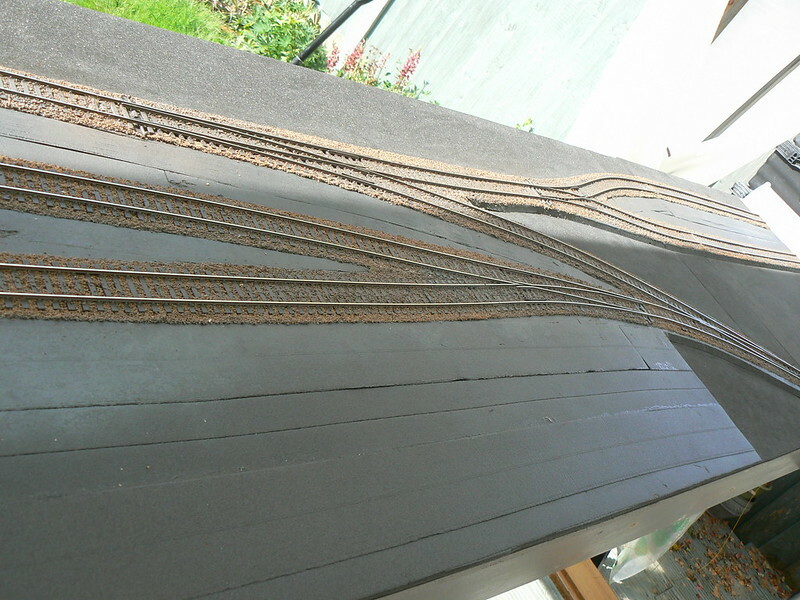 With a spell of clear weather on the horizon, it was back outside with the layout so I could now get the whole track-bed weathered. It had been a long while since I last used my airbrush so that got a thorough clean first, then a few practice blasts before I hit the track. 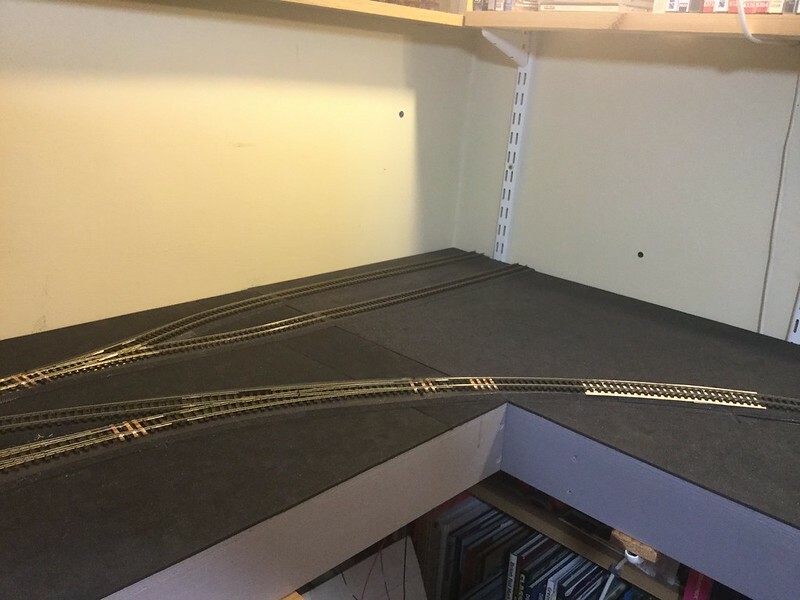 After a couple of deep breaths, I did it, from both sides of the layout, first with grey then with track colour, cleaning the railheads both times. Remarkably, this job took only a couple of hours of quick work. 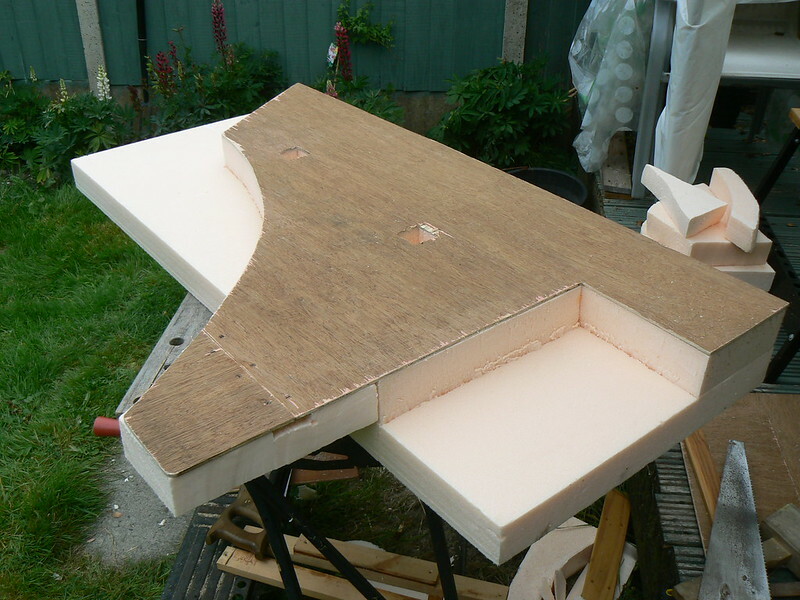 I had also started on my back-scene boards which for now, are simple strips of thin plywood, some recovered from other projects and are to be painted a neutral pale to mid grey. When coming to shield my traverser from public gaze, here is where I came across a hitherto unforeseen problem. The backscene has to shield the traverser including when at it’s fully extended position, otherwise the traverser is useless. 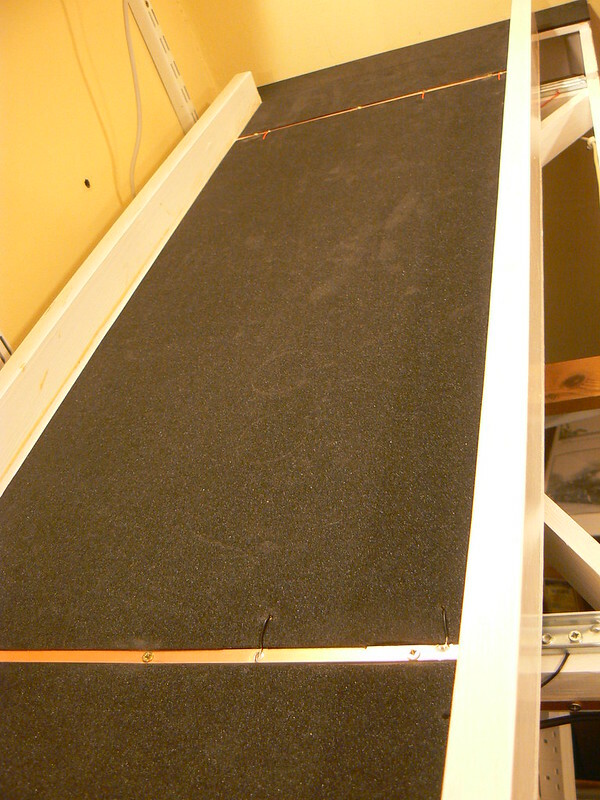 When set up in my box room, the wall prevents the traverser from fully extending but in the open, it reaches beyond the width of the baseboard. This would mean that the backscene has to be supported in fresh air! 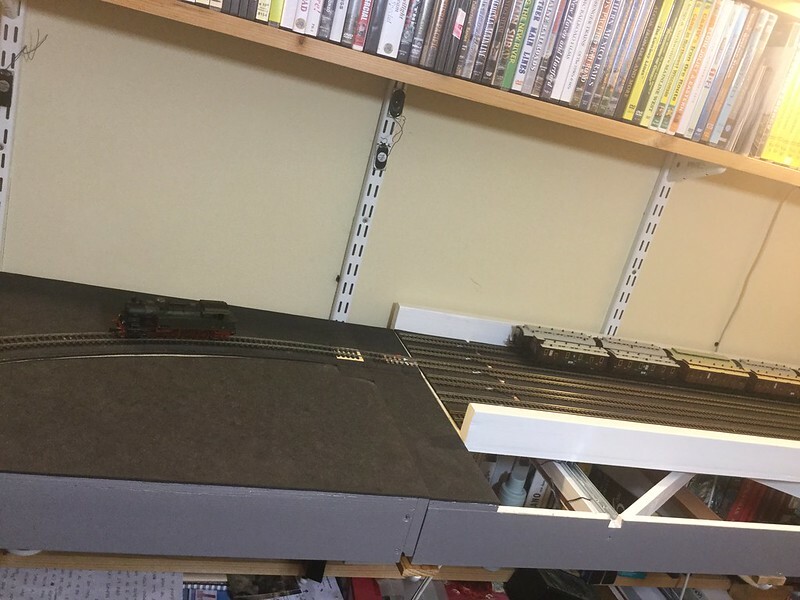 My only visible solution was to build a baseboard extension for the traverser board and having done that, I thought that I might as well add a matching scenic extension board too. The layout has now grown by three new baseboards however, only one of which is for home use and this was always planned anyway. 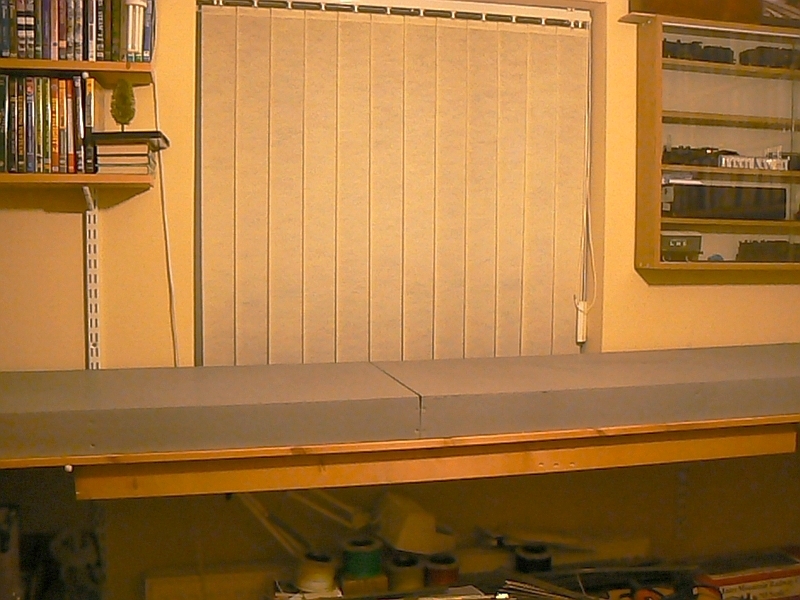 I was now in a position to finalise the backscene boards which then let me make a start on building the scenery ‘proper’. 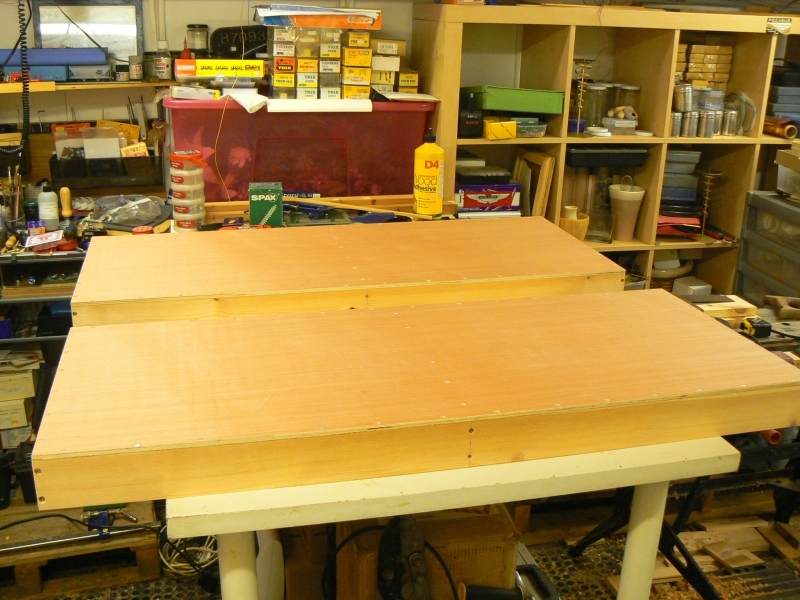 At this point, I was committed to adding “hills” directly to the main baseboards when Doug informed me that he had never worked on sectional layout scenery before and he wondered how we would avoid the very obvious joins between the baseboards. This was now panic time for me as I have never gotten beyond this point before and was in brand new territory. Somehow, a flash of inspiration came to me - something to do with the new extensions for the traverser. I reasoned that I needed one scenic section for home use (slim) and one separate section for exhibition use (broader). 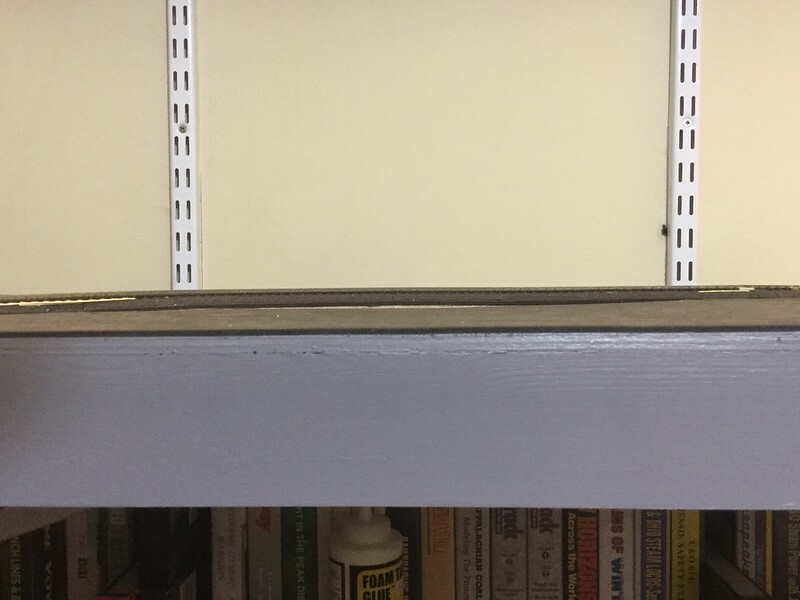 This gave me the idea of individual lift out sections that would have no joins in them as the sections can now span across two or more baseboard joins. I felt this was the kind of thinking that Iain Rice (a railway modelling and writing hero) might approve of, hopefully! 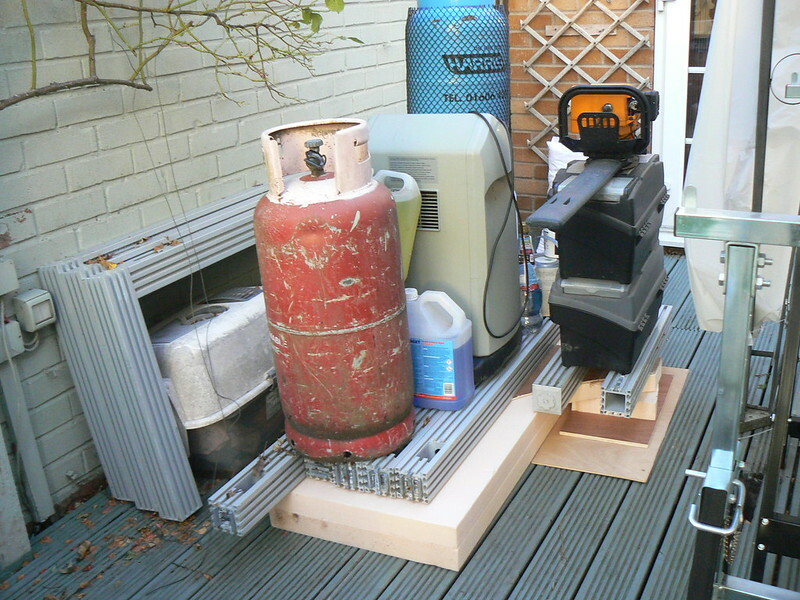 I gathered up all my remaining pieces of plywood but still had to form the larger section from two pieces and when it came to gluing the pink foam* boards onto the sub-board, I weighed everything down with all the heavy objects I could easily lay my hands on. 24 hours under approximately 150Kg worked quite well. 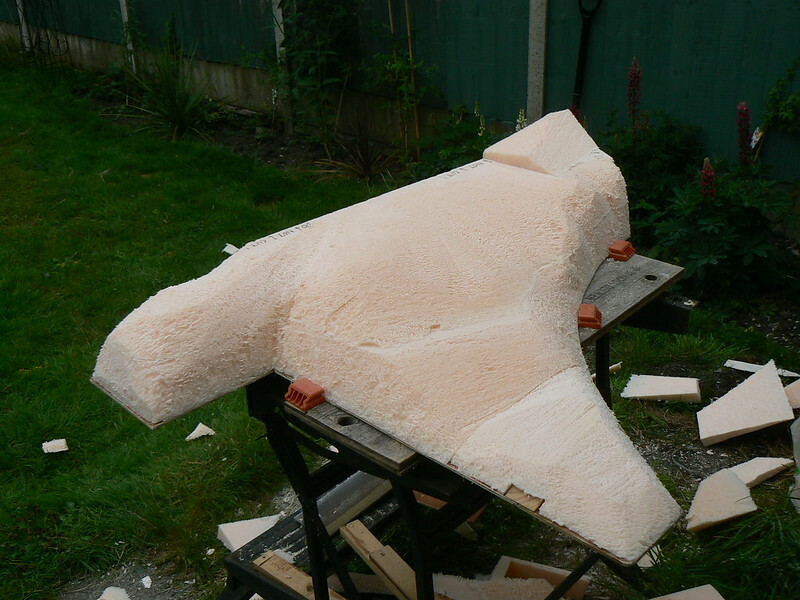 Now it was time to start carving the hills themselves - the smaller section I had attacked with an old bread knife but I found that quite hard going so with the larger section, I thought of using my hand saw. This worked well enough for the major profiles then I switched to my surform and was able to finish my landform quite easily. With some logistical changes occurring at Doug’s house with regard to space issues, we agreed to work on my scenery together at my house so I cleared an area in my big shed and set Leberecht up there, ready for a site inspection by Doug. I’ve now ended up with Doug’s impressive collection of scenery building supplies at my house and additional jobs! 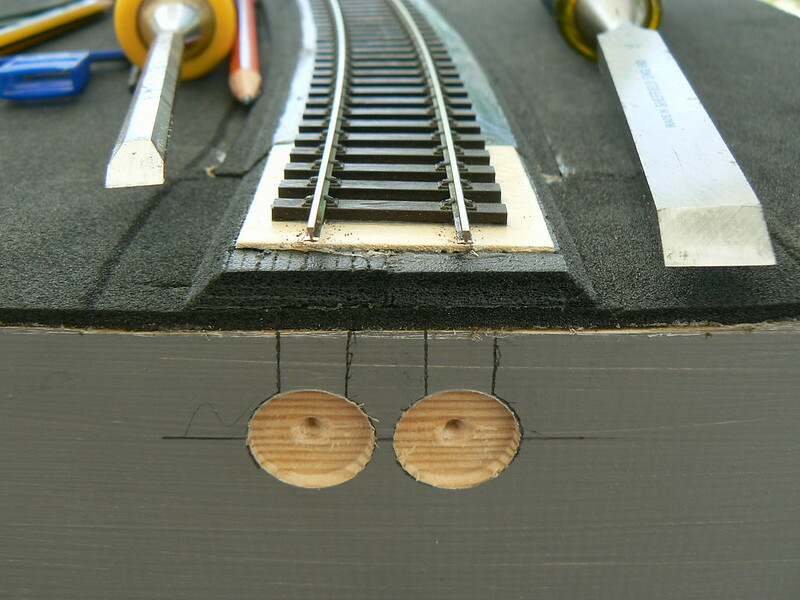 I had built the faces of my cutting too close to the track, leaving no room for actual scenic treatment so we agreed that I will cut that area back somewhat. This will allow us to add some treatments that should completely disguise where the terrain joins are. *Why are these so hard to obtain in the UK?